Please telephone for details of these camper vans. Finance available from Bear Credit Ltd – telephone James on 07828 634583 for more information. Or vistit www.bearcredit.co.uk. Subject to status, terms and condition apply. Bear Credit is a credit broker not a lender and is authorised by the financial conduct authority. 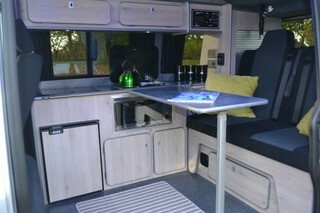 Another campervan from our fabulous Lunar range. 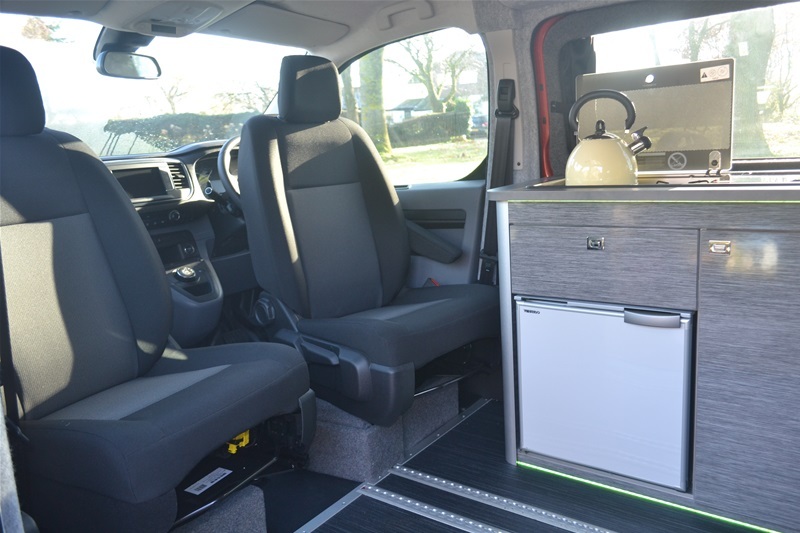 This Toyota Proace Lerina was voted van of the year in 2018. 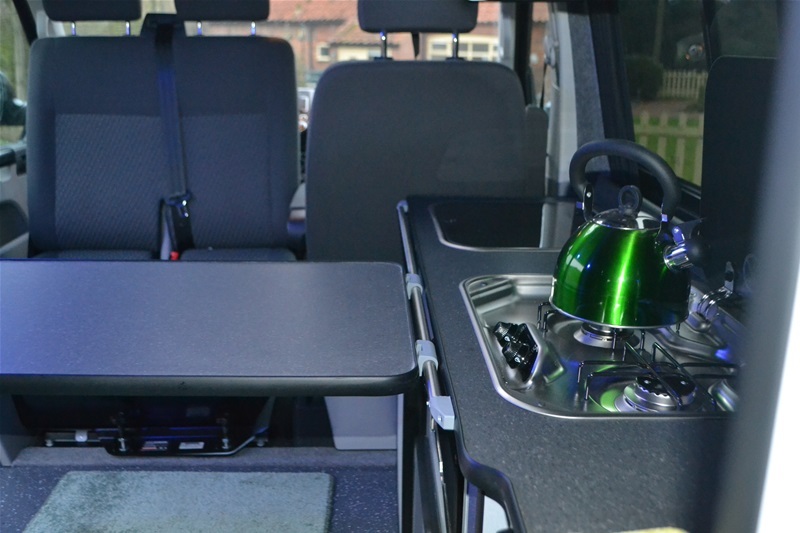 These campers are type approved by Toyota and come complete with every conceivable extra including remote locking keyless entry, air conditioning, cruise control, satellite navigation, Eberspascher diesel heating, 100 watt solar panel, DAB stereo with Bluetooth, driver and passenger swivelling seats, roof bed, German made crash tested sliding seat system with multi point fixings, portable toilet, 240/12 volt and USB power outlets, glass top hob and sink, compressor fridge. Also fitted as standard is the pro touch 7" multi media system. 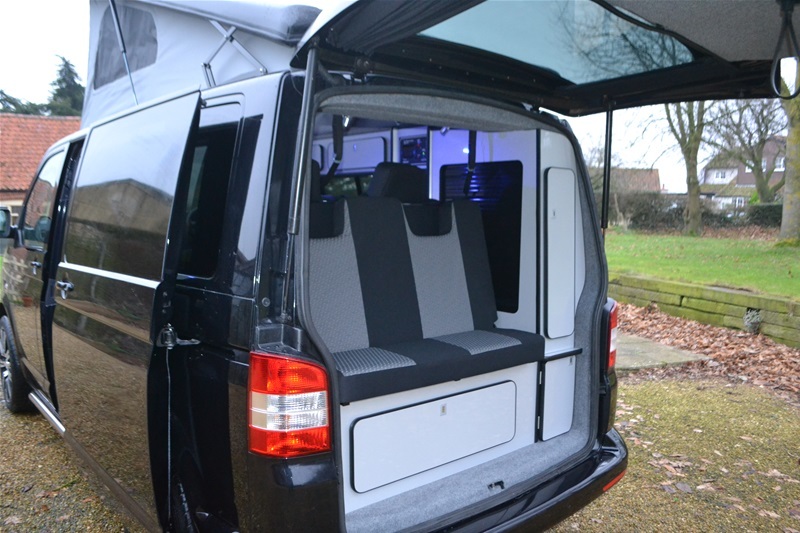 This stunning campervan is our ex show model and looks fabulous in its all black livery. 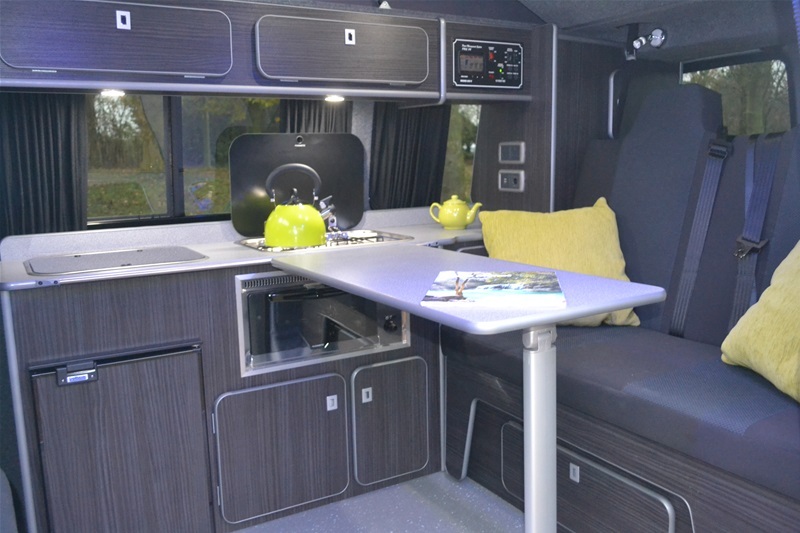 It also benefits from show extras such as all leather seating, metallic paint, Fiamma wind out awning. Its 180 bhp engine linked to an automatic gearbox makes for a fantastic drive. These vehicles come with a 5 year Toyota warranty and a 2 year habitation warranty. Book a test drive today. 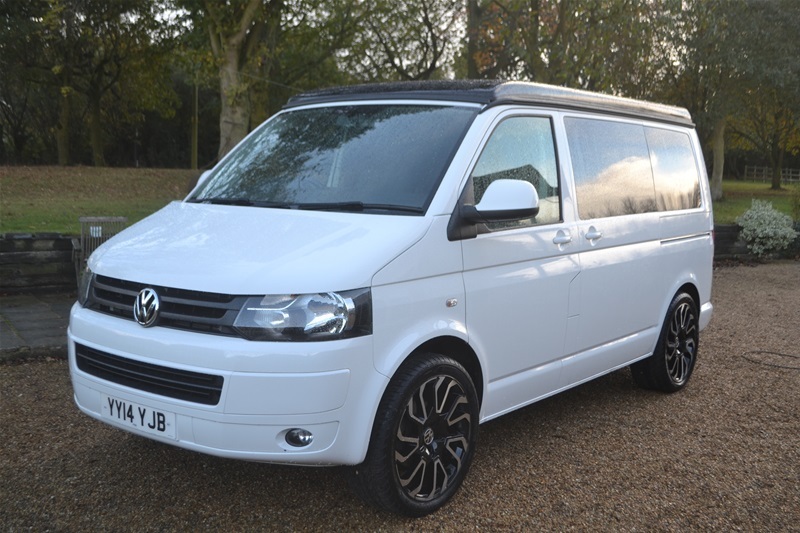 We have just been fortunate to take this superb white T5 Hi line back for resale. It has been well looked after over the last couple of years and has only ever been used for days out. The Hi line comes with all the extras i.e. 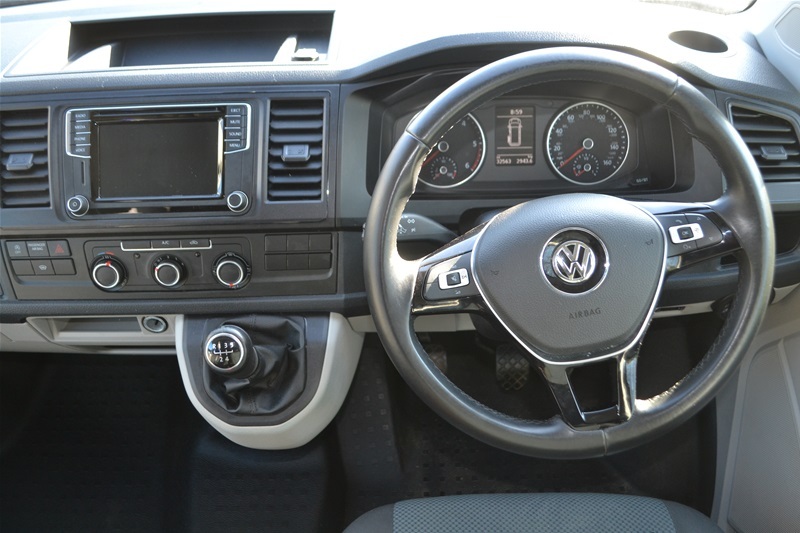 cruise control, parking sensors, captains seat etc. 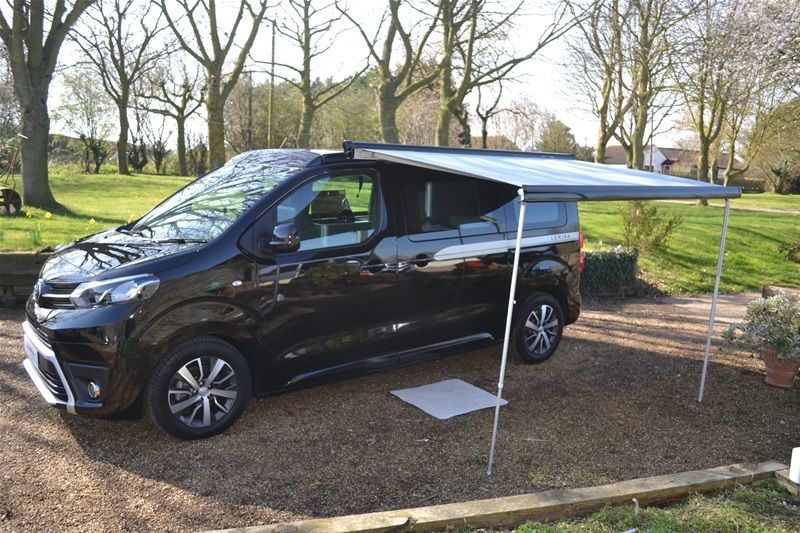 but this one has the addition of being a rare tailgate model, it also benefits from gas/electric heating, has a rear spoiler, side wind deflectors and a useful second table mounted by the swivelling front seat. 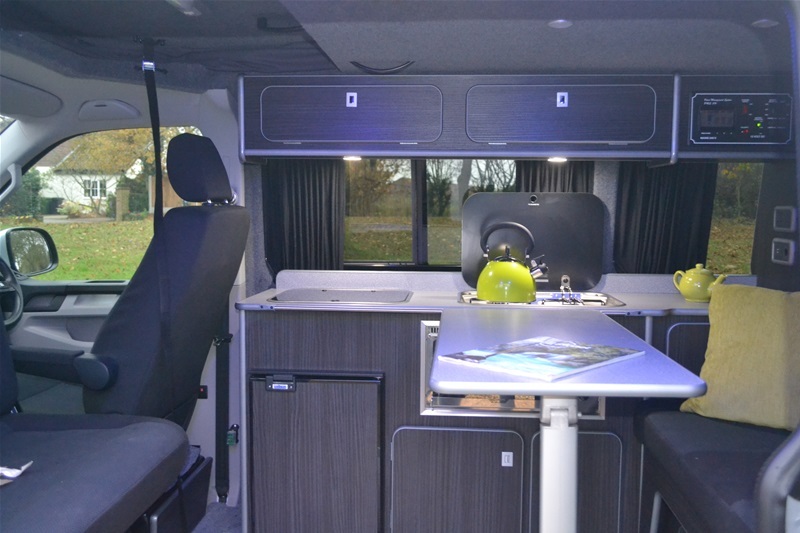 The conversion includes more than ample storage, elevating roof with bed on gas struts, hob, sink, grill, fridge, full electric hook up facility, 110 amp leisure battery, double swivelling passenger seat giving 5 belted seats in all, porta potti storage, certificated ed bed with built in head restraints, 12 volt LED lights plus auto entry/exit lights, on board water tank. 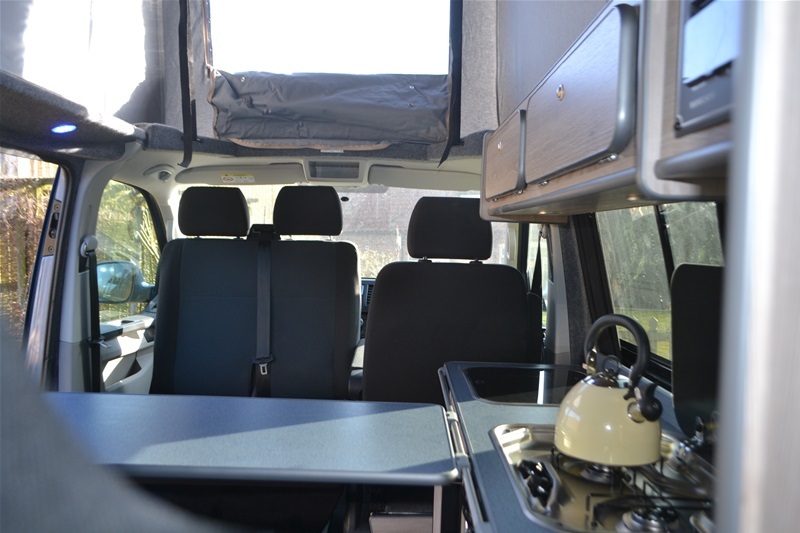 Here is a great opportunity to get a very lightly used, top specification, low mileage (29,000 miles) T5 campervan in as new condition.Fully serviced by Robinsons in Norwich and powered by a low emmission 102bhp engine. Ready to go camping now. Sold with 3 months vehicle warranty and 12 months habitation warranty. Wow! Words fail us on this one. Stunning just doesn't do it justice. 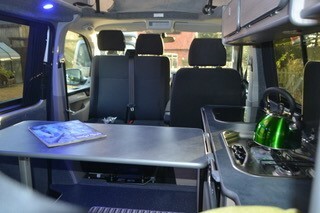 A top spec Hi line van that comes with all the usual extras i.e cruise control, parking sensors, air con, captains seat. On the outside we have a two tone metallic silver and gunmetal grey with full sportline front conversion, bonnet deflector, rear spoiler and sportline side bars. Added to that it is lowered on H and R 50mm springs and sits on AXE CS Lite Hyper Black 19" alloy wheels. 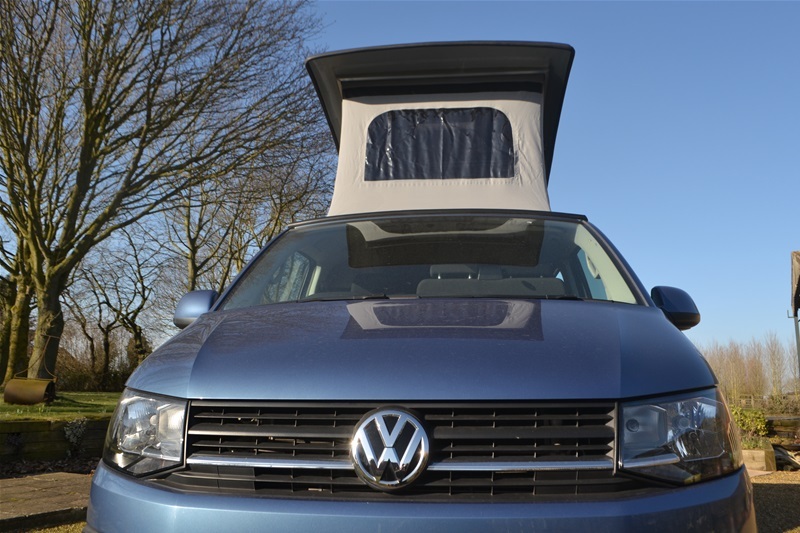 There is also a detachable tow bar, fog and day lights, a light bar headlight upgrade and a VW multi rail, roof mounted solar panel. The look is fabulous. The interior follows on in the same theme. 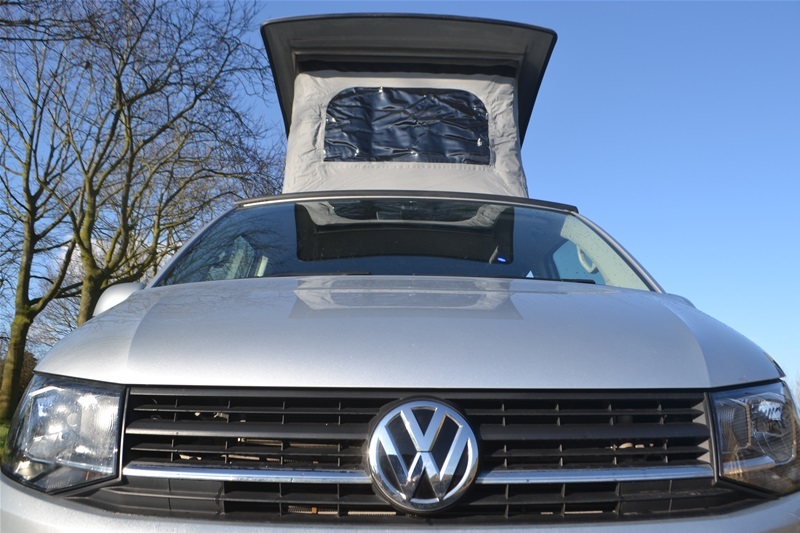 The elevating roof supports a bed with mattress on gas struts and the tented sides unzip completely to give an amazing viewing platform. Just imagine sitting up there with a glass of wine watching the sunset. 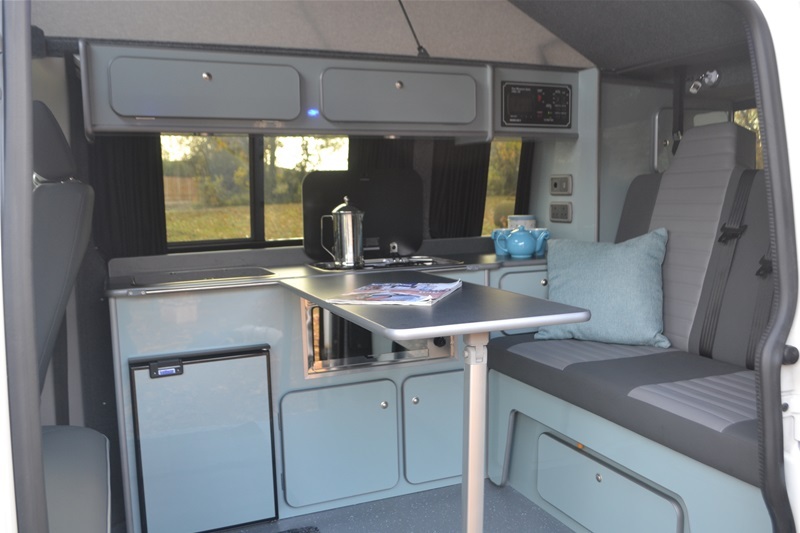 Down below we have a M1 tested rock and roll bed, hob, sink, 110 amp leisure battery, LED soft touch lights in blue and white, great storage, swivelling double front passenger seat. There is also an audio upgrade which consists of Kenwood DMX 7017 DABS head unit, Audison front and rear speakers, Hertz DBA 200.3 sub woofer, Hertz D Power 4 channel amp, Kenwood DRV-N520 dashcam. 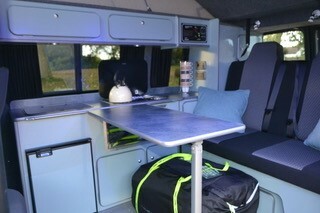 So a fabulous looking camper with all the equipment and ready to go now. 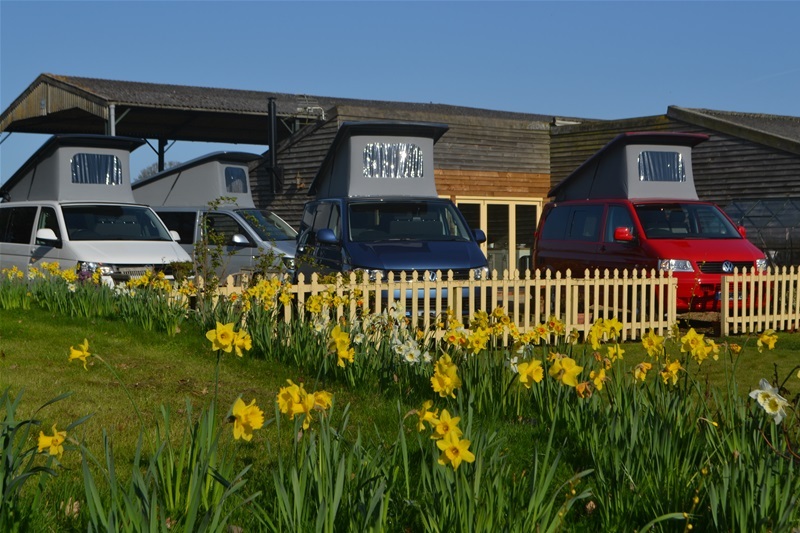 This will be a real head turner on any campsite. 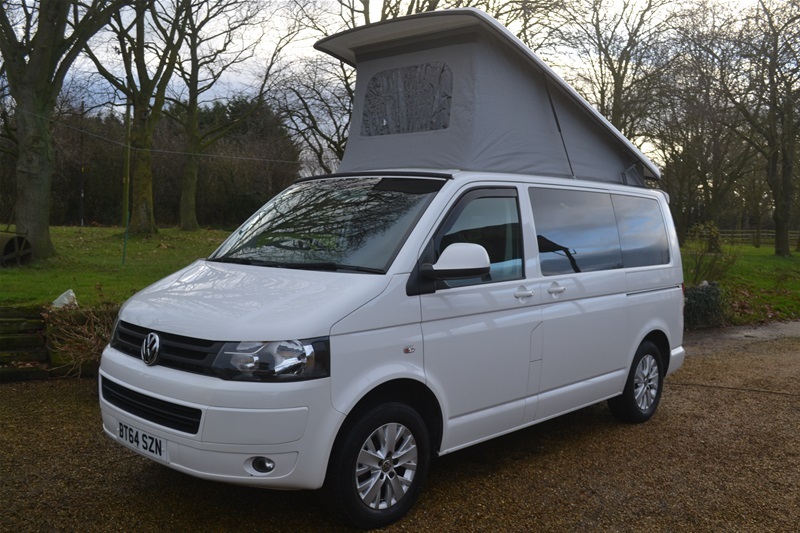 If you want to be the proud owner of this camper give us a call now. Sold with 3 months vehicle warranty and 12 months habitation warranty. 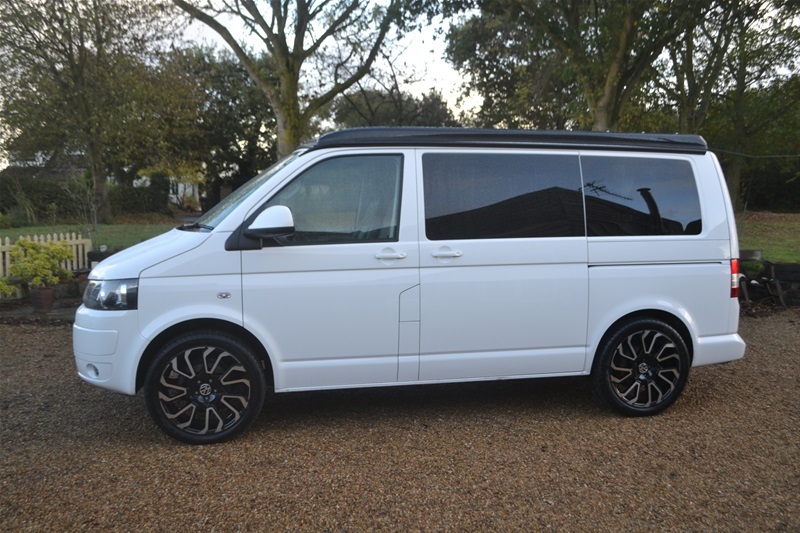 This is a super stylish white T5 that has just come in for re-sale. A sought after tailgate model with a contrasting black roof. 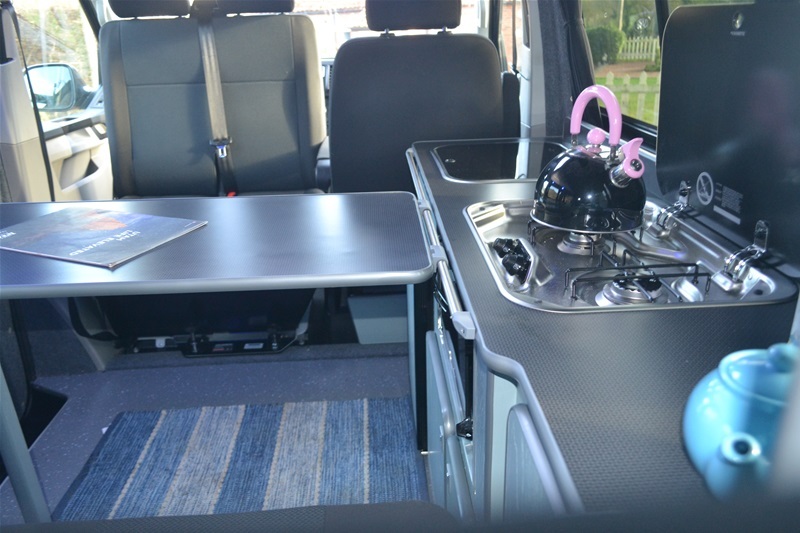 Add that to that a fabulous set of 20" black alloy wheels and you've got a real stunner of a campervan.The inside too follows the same theme with baby blue gloss furniture and faux leather Bentley stitched seating. 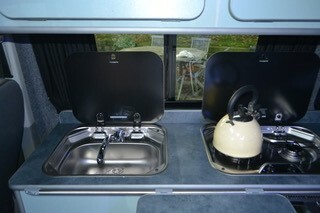 The conversion includes more than ample storage, elevating roof with bed on gas struts, hob, sink, grill, fridge, full hook up facility, 100 amp leisure battery, double swivelling passenger seat giving 5 belted seats in all, porta potti storage, certificated bed with built in head restraints, 12 volt LED lighting with auto entry/exit lights, 60 litre on board water tank. 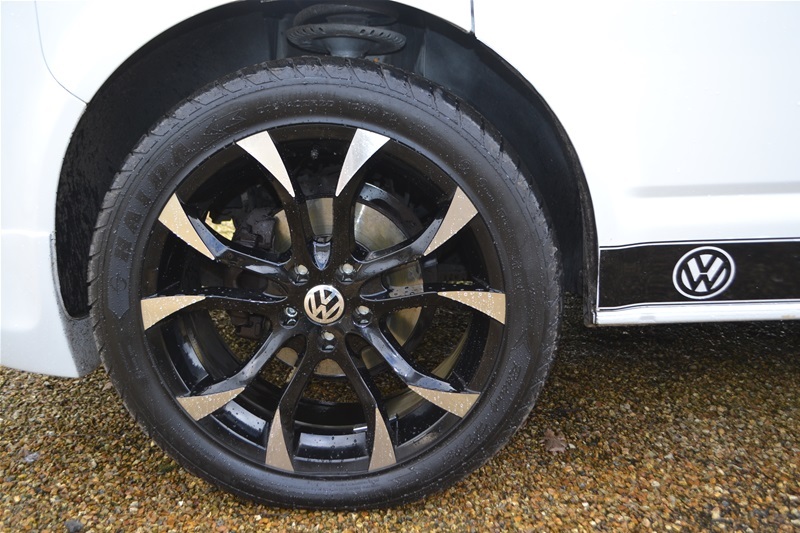 In as new condition and with only just over 40,000 recorded miles and other extras including a black VW multi rail and a detachable tow bar you've got the VW look and everything that goes with it. Ready to go camping now. 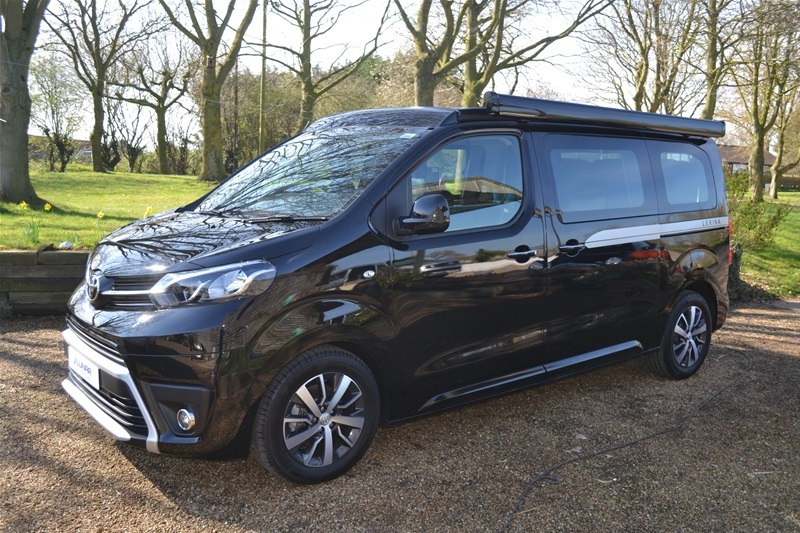 Another fabulous Toyota Proace Lerina - voted Van of the Year in 2018. 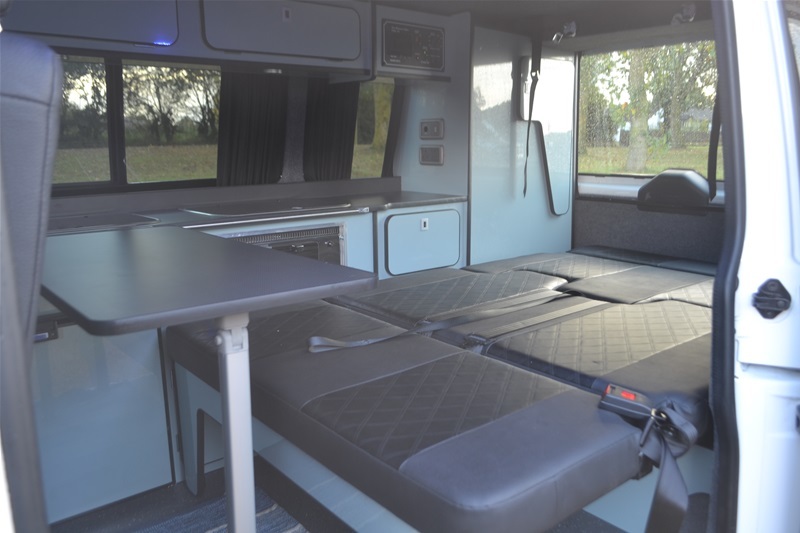 These campers are type approved by Toyota and come complete with every conceivable extra including remote locking keyless entry, air con, cruise control, sat nav, Eberspascher diesel heating, 100 watt solar panel, DAB stereo with bluetooth, driver and passenger swivelling seats, roof bed and mattress, German made crash tested sliding seat system with multi point fixings, portable toilet, 240/12 volt and usb power outlets, hob, sink, fridge. Also fitted as standard is a pro touch 7" multi media system. 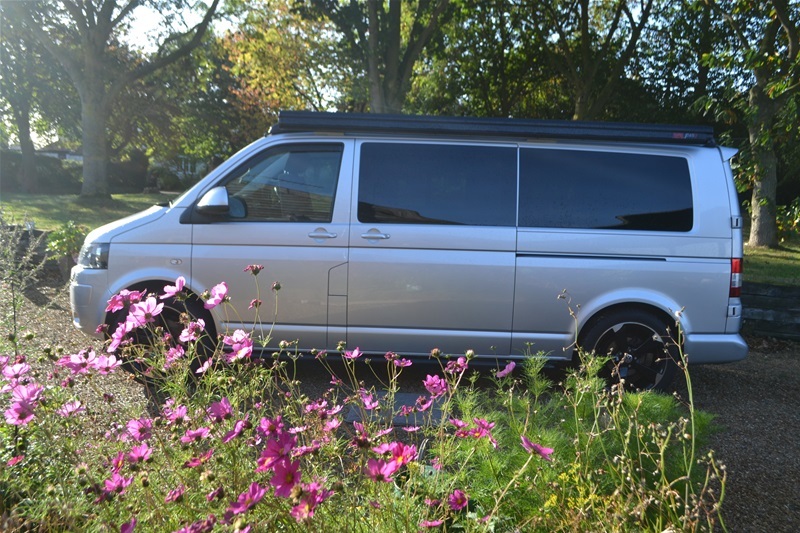 This stunning campervan in Rich Oak with a powerful 120 bhp engine and manual gearbox makes for a fabulous drive. These vehicles come with 5 year Toyota warranty and 2 year habitation warranty. Book a test drive today. Just 12 months old, 7000 miles on the clock and obviously in as new condition. 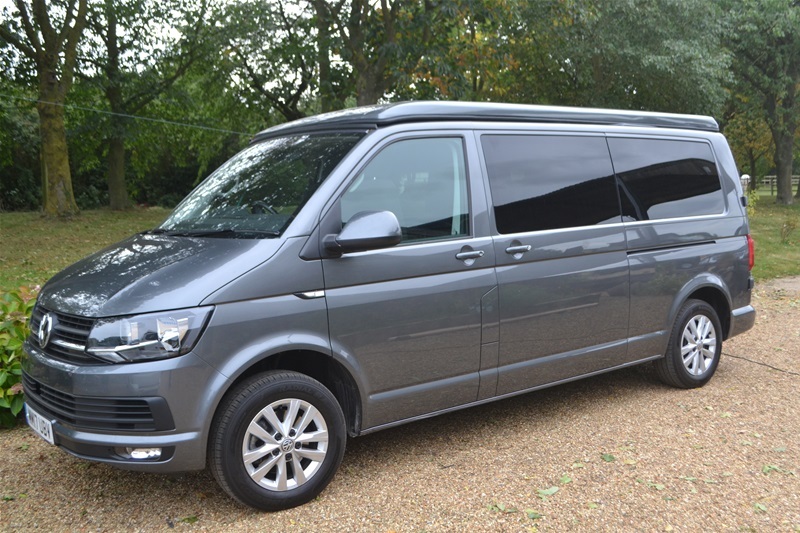 Another superb T6 with latest Euro 6 engine. 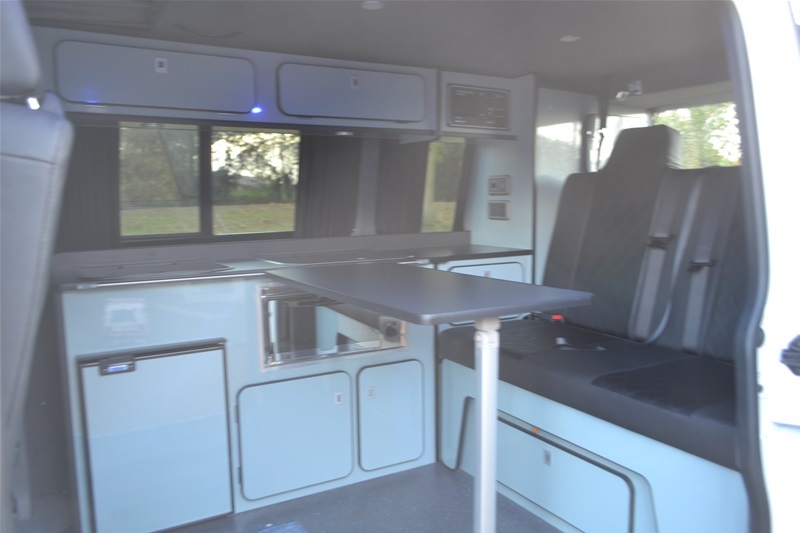 A top spec Hi line van with all the extras you would expect on a luxury vehicle i.e. cruise control, parking sensors, captains seat. The conversion includes more than ample storage, panoramic elevating roof that unzips to give a fabulous viewing platform with bed on gas struts, hob, sink, grill, fridge, 110 amp leisure battery, double swivelling passenger seat giving 5 belted seats in all, certificated bed with built in head restraints, 12 volt LED lighting, 60 litre on board water tank. 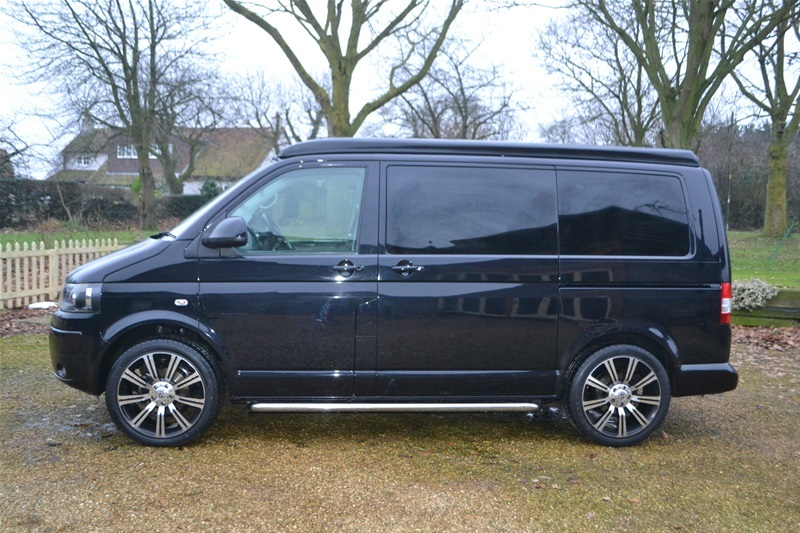 A great opportunity to have a low mileage, top specification T6 with a stunning interior. Powered by a 102 bhp engine and a 5 speed gear box makes for efortless continental cruising. Sold with the balance of the manufacturers warranty and 12 month habitation warranty. 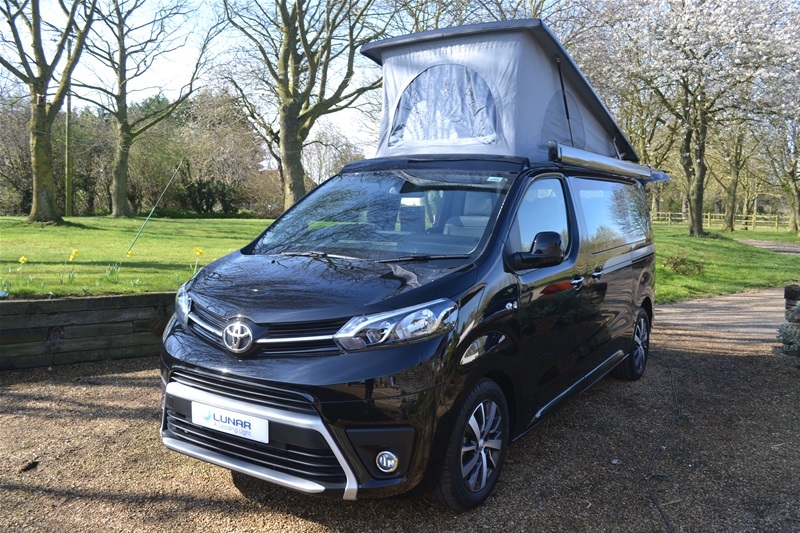 This year we are doing a brand new range of camper vans and the first one is this fabulous Toyota Proace Lerina, voted van of the year in 2018. 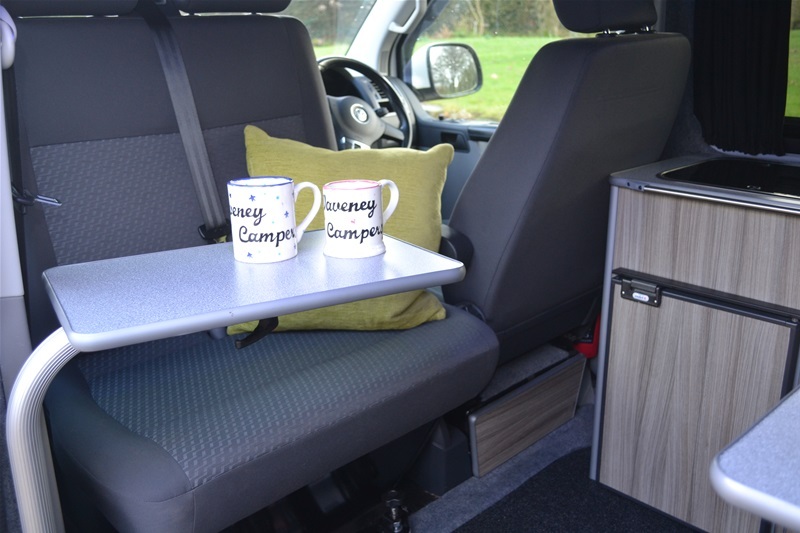 These campers are type approved by Toyota and come complete with every conceivable extra including remote locking keyless entry, air con, cruise control, sat nav, Eberspascher diesel heating, 100 watt solar panel, DAB stereo with bluetooth, driver and passenger swivelling seats, roof bed, German made crash tested sliding seat system with multi point fixings, portable toilet, 240/12 volt and USB power outlets, glass top hob and sink, compressor fridge. Also fitted as standard is the pro touch 7" multi media system. You can also add extra single seats or floor fixing point rings to attach items such as dog cages. 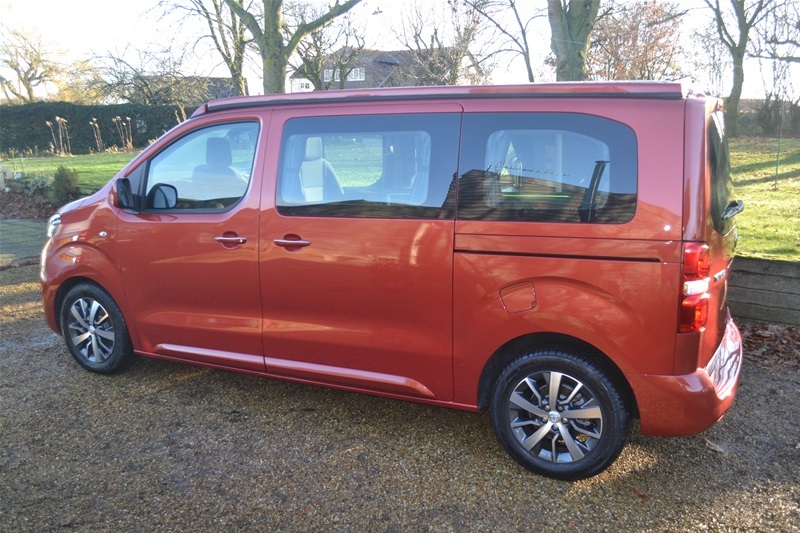 This stunning campervan in Ember Orange and with 180bhp engine linked to an automatic gearbox makes for a fabulous drive. 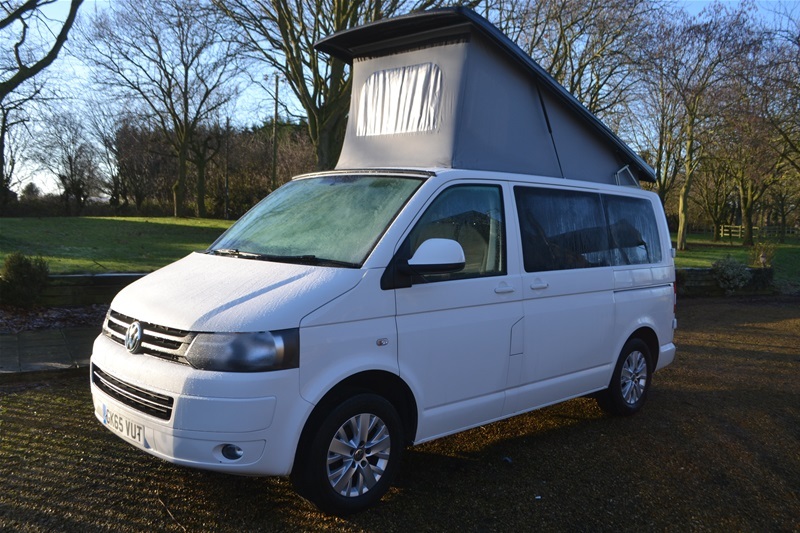 We have just taken in this immaculate one owner Danbury Surf. 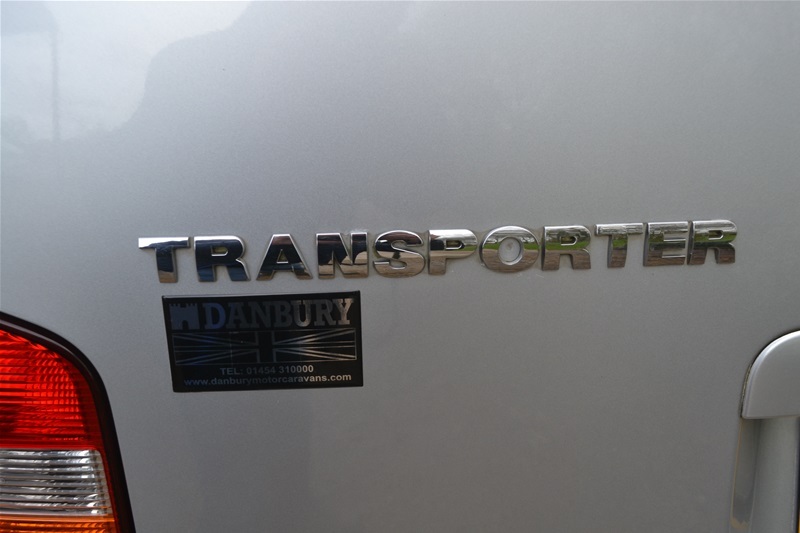 Danbury have been renowned converters of campervans for many, many years. 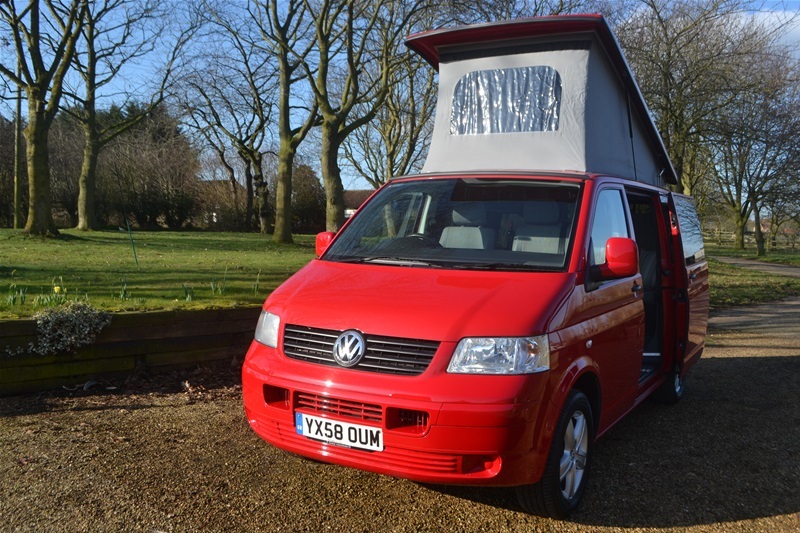 So a fully professionally converted and low mileage (36,000) fully serviced meticulously looked after campervan. 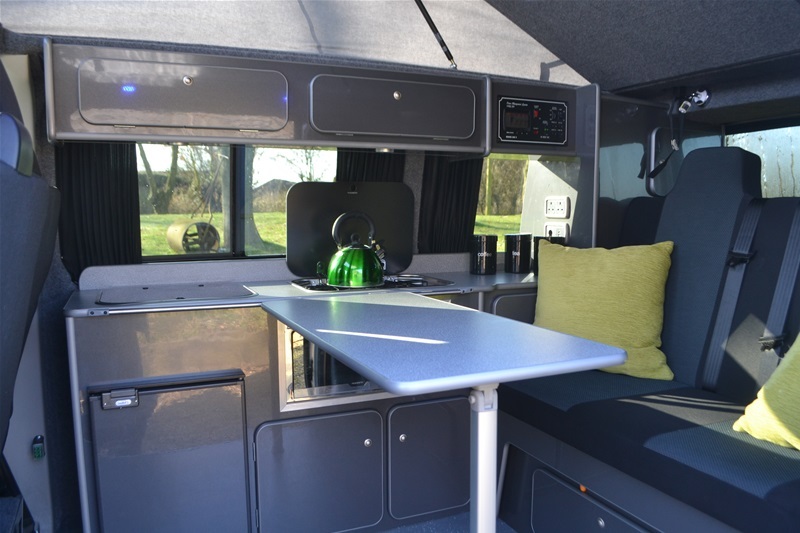 The conversion includes more than ample storage, elevating roof, hob, sink,grill, fridge, full electric hook up facility, single swivelling passenger seat, porta potti with storage, 12 volt LED lights, on board water and waste tanks. 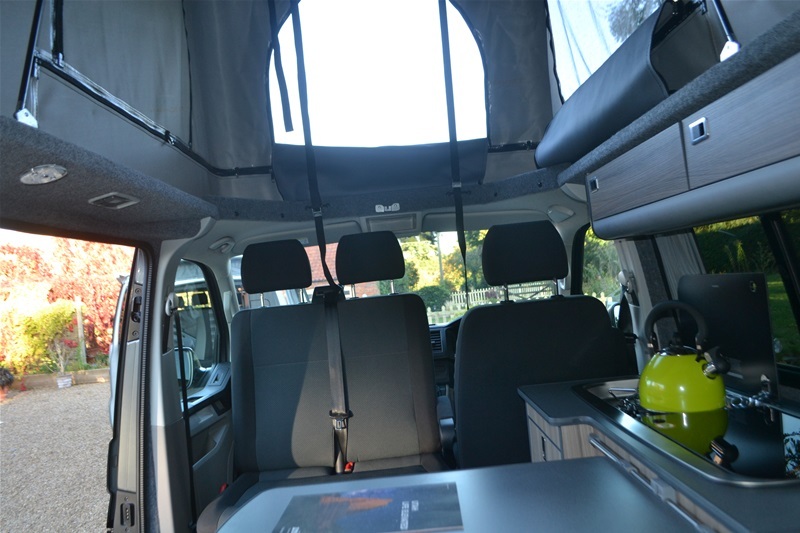 Add to the list tailgate model, air conditioning, full electric pack, private number plates, window blinds, awning rail and some camping equipment and you have one super campe van. Serviced, MOT'd and ready to go camping. Sold with 3 months warranty. Book a test drive now. 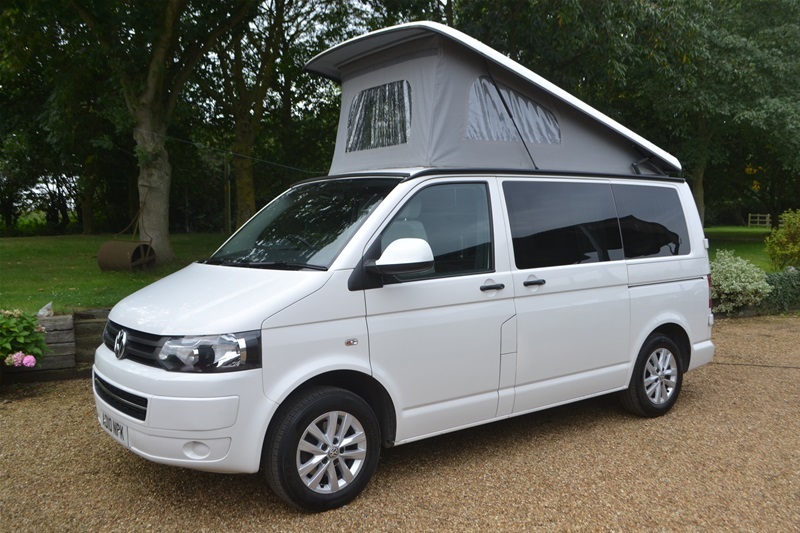 We have ordered two of these fabulous vehicles and they will be ready for conversion in late October. At the moment if a customer were to order one they could choose the colour of the interior furnishings. The specification of these vehicles is just the best - LWB, metallic Iridium Grey paintwork (one of our most popular colours), 150bhp engine, 6 speed gear box, and most importantly AUTOMATIC. 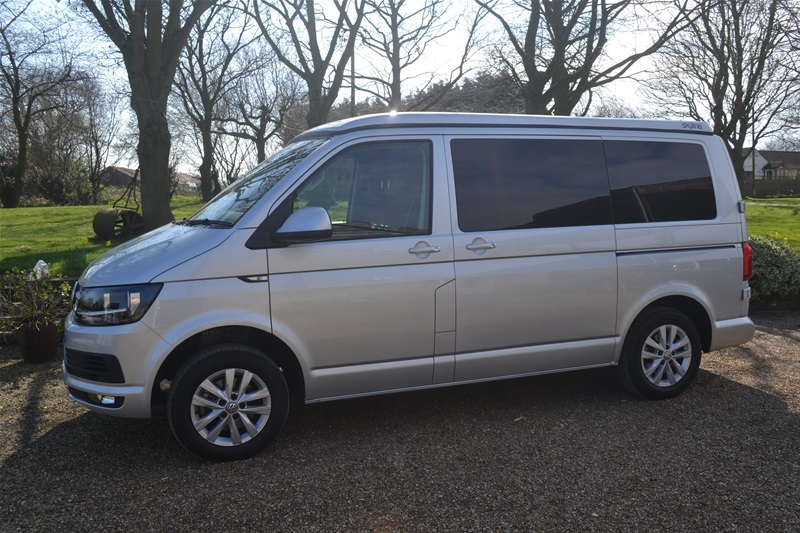 Added to this of course is the equipment you would expect of a high specification vehicle i.e cruise control, parking sensors, auto stop/start, air con, multi function steering wheel, latest Euro 6 engine etc. 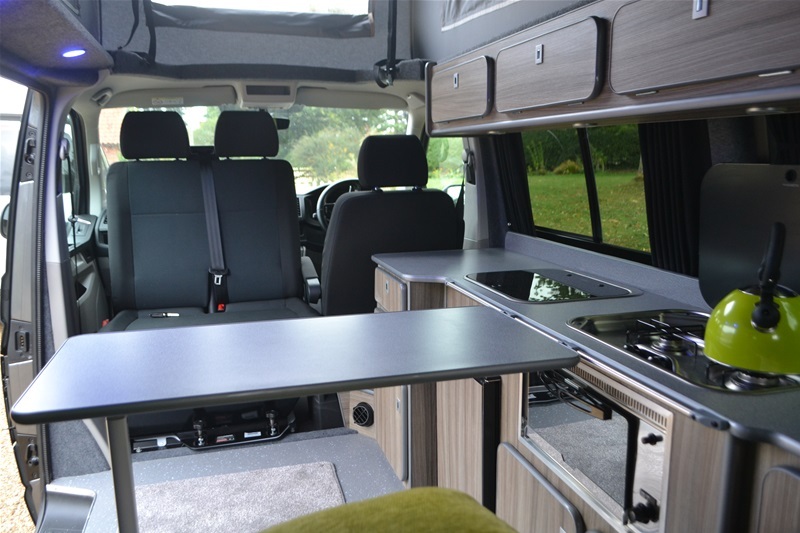 The LWB VW, although only 18" longer than the SWB does give a huge amount of extra space inside the campervan (just look at the photos of the interior of this van). 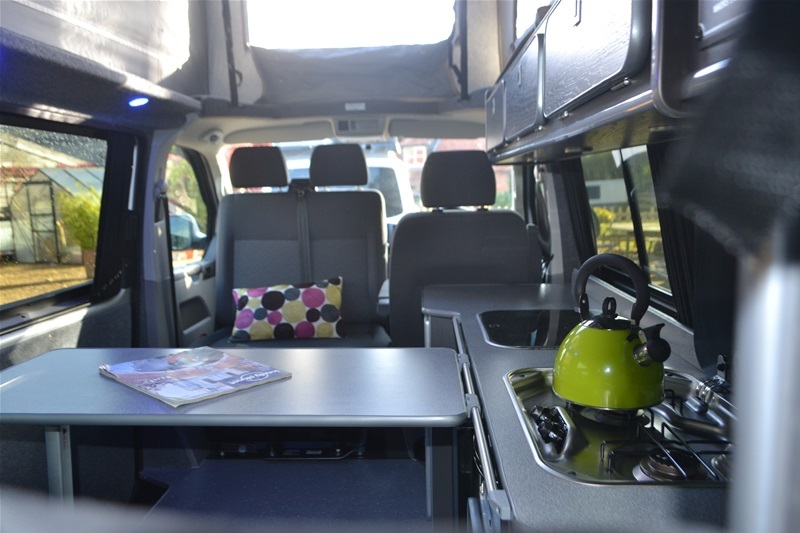 The conversion includes more than ample storage, elevating roof with bed on gas struts, hob, sink, grill, fridge, full electric hook up facility, 110 amp leisure battery, double swivelling passenger seat giving 5 belted seats in all, porta potti storage, certificated bed with built in head restraints, 12 volt LED lights plus auto entry/exit lights, 60 litre on board water tank. It's taken us 2 years to find the time to do our second retro camper van but it's certainly been worth waiting for. What a fabulous looking camper it is. 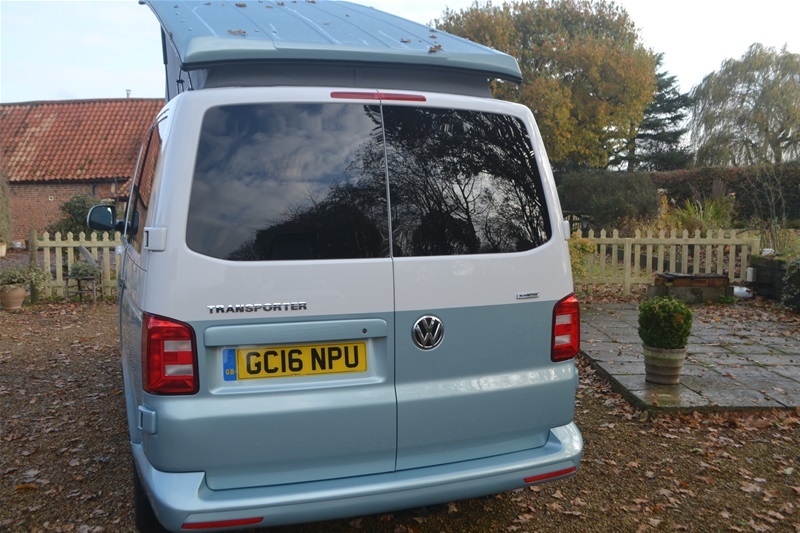 The bodywork is in metallic baby blue and white with a contrasting roof. 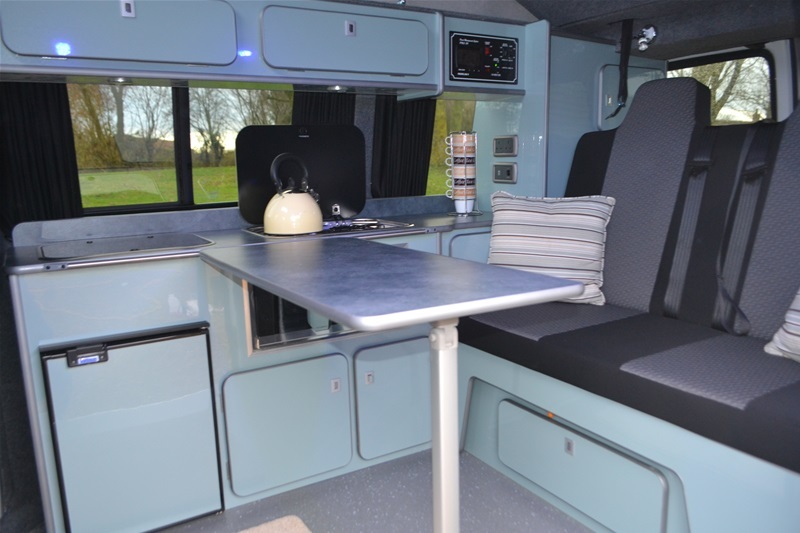 Inside we have matched it with baby blue high gloss furniture with contrasting work surfaces, flooring and two tone grey faux leather retro stitched seats with VW embroidered headrests. We've even put in a retro dashboard with matching blue and white trim. 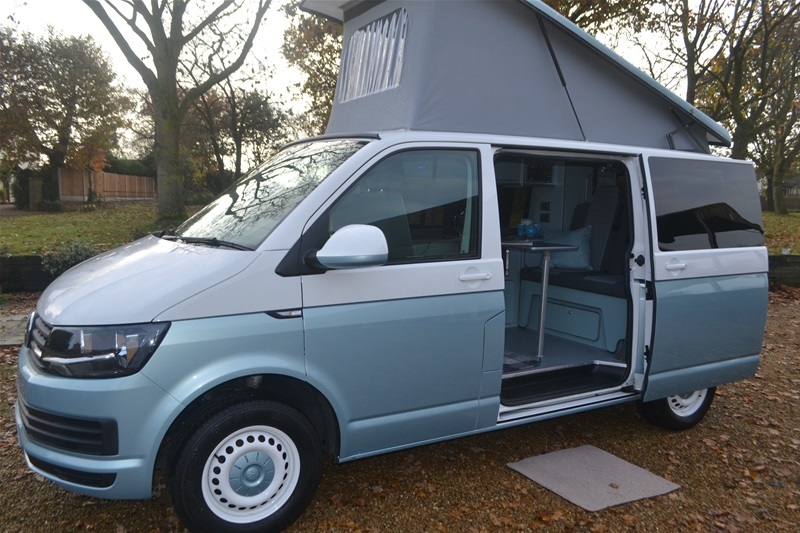 So here we have a T6 that is just 2 years old converted to a retro finish but with all the modern features of the latest vehicles. The look really is quite stunning so if you want to be the envy of your friends and other VW enthusiasts then come and have a look at this. You won't be disappointed. it is being sold with the balance of the manufacturers warranty plus 12 months habitation warranty. 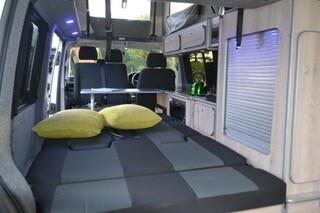 It is not very often we get to convert a black campervan but when finished they always look stunning. With matching black windows this is a really cool camper. This one is also complemented by a fabulous interior in gloss powder blue furniture and contrasting work surfaces and flooring. 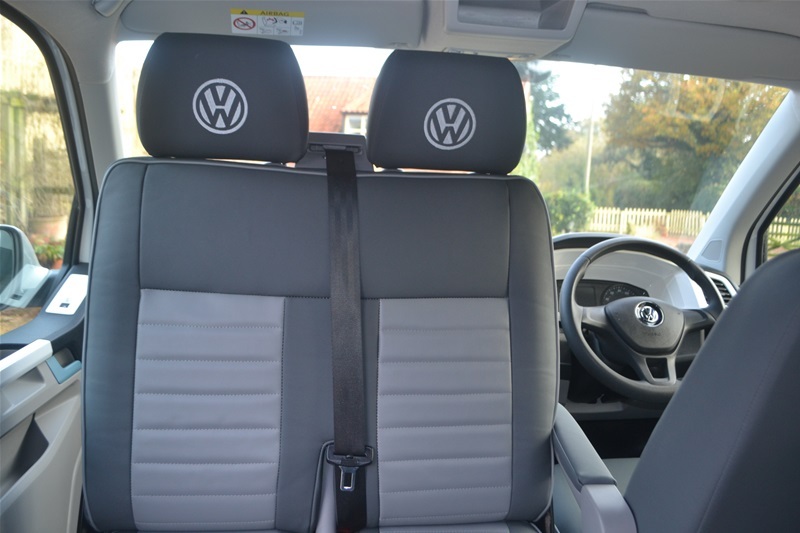 This is a top spec VW Trendline that comes with loads of ectras i.e. 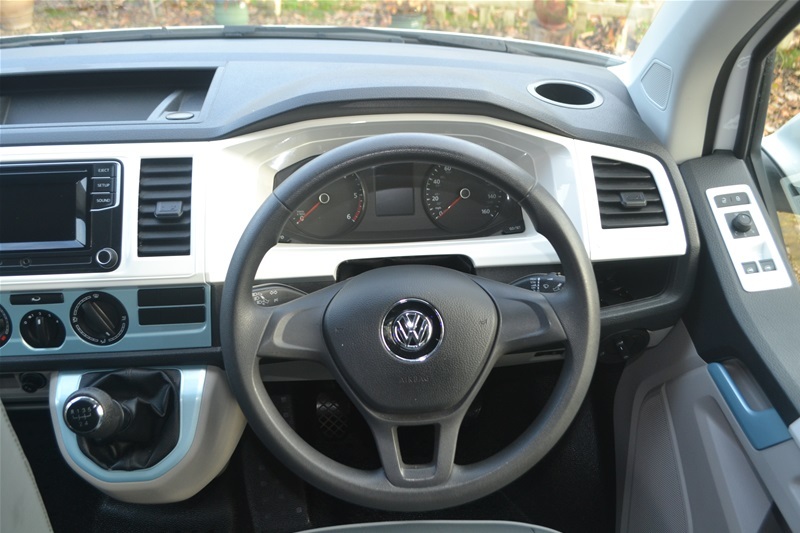 cruise control, parking sensors, full electric pack etc. The conversion includes more than ample storage, elevating roof with bed on gas struts, hob, sink, grill, fridge, full electric hook up facility, 100 amp leisure battery, double swivelling passenger seat giving 5 belted seats in all, porta potti storage, certificated bed with built in head restraints, 12 volt LED plus auto entry/exit lights, 60 litre on board water tank. 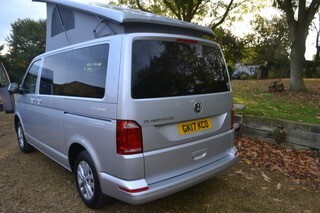 So here is a fabulous low mileage T6 that is powered by the latest Euro 6 low emission 102 bhp diesel engine. 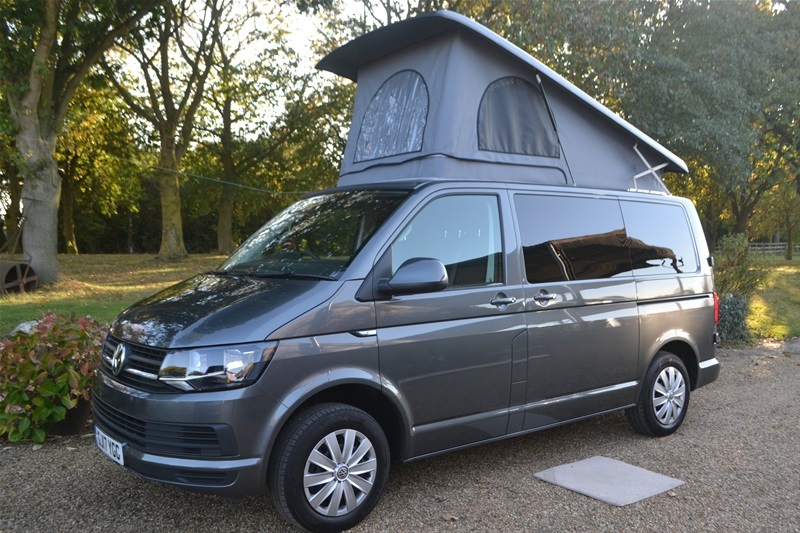 A super looking camper and great to drive too. Sold with the balance of the manufactures warranty and 12 months habitation warranty. 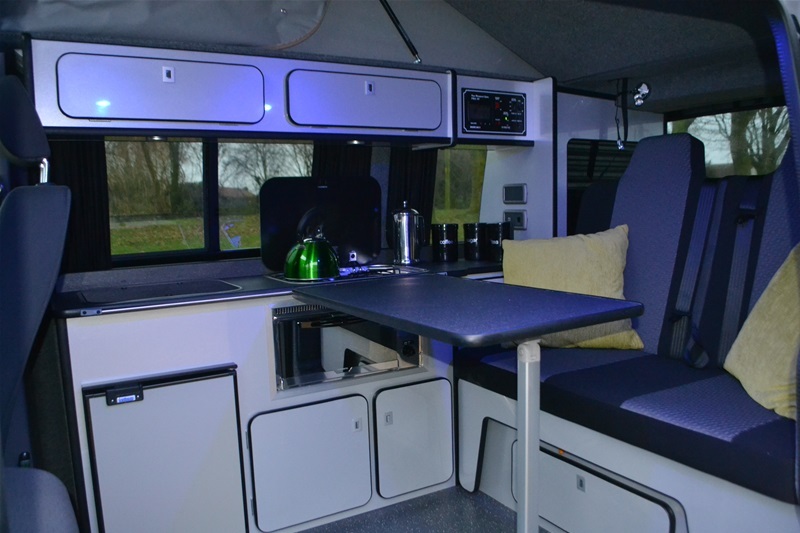 This is the first camper that we have had in Starlight Blue and it looks fabulous. Almost black in bright sunlight and a deep blue at other times. A top specification VW Hi line that comes with all the extras i.e. cruise control, air con, parking sensors, captains drivers seat etc. and also on this van the bonus of a tailgate. 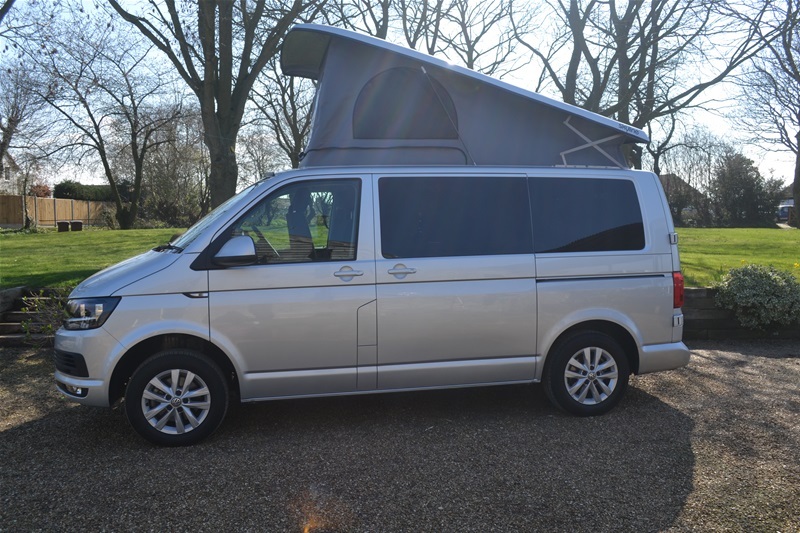 A superb low mileage T6 with a full camper conversion. Powered by the latest Euro 6 low emission 102 bhp engine. Sold with the balance of the manufacturers warranty and 12 months habitation warranty. 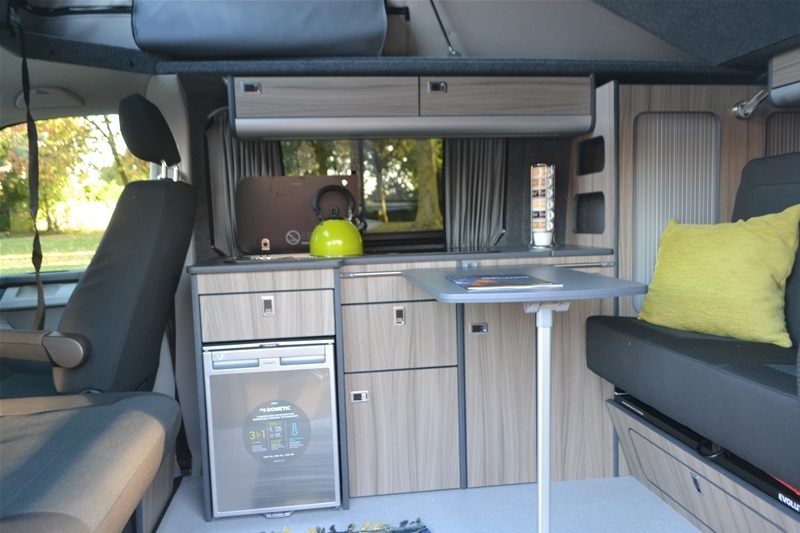 What is the best colour combination for a really cool VW campervan? 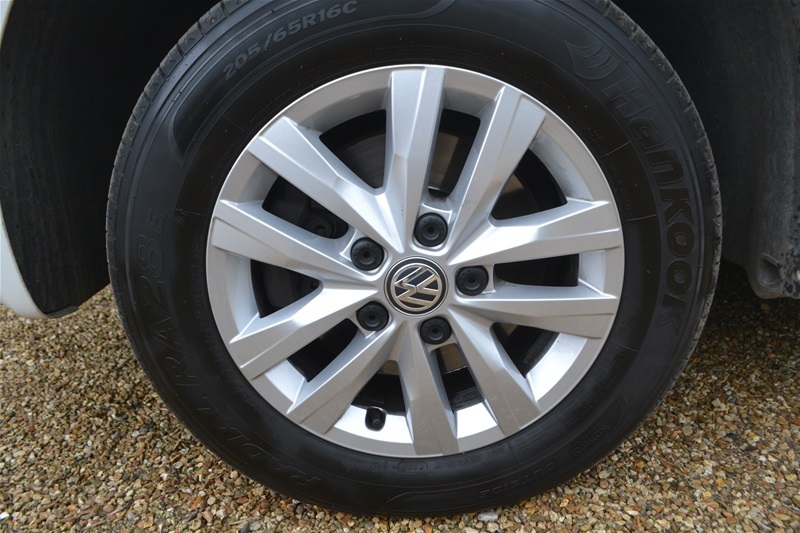 White with black trim is always popular but silver with a black roof, black wheels and trim makes for a super cool VW look. 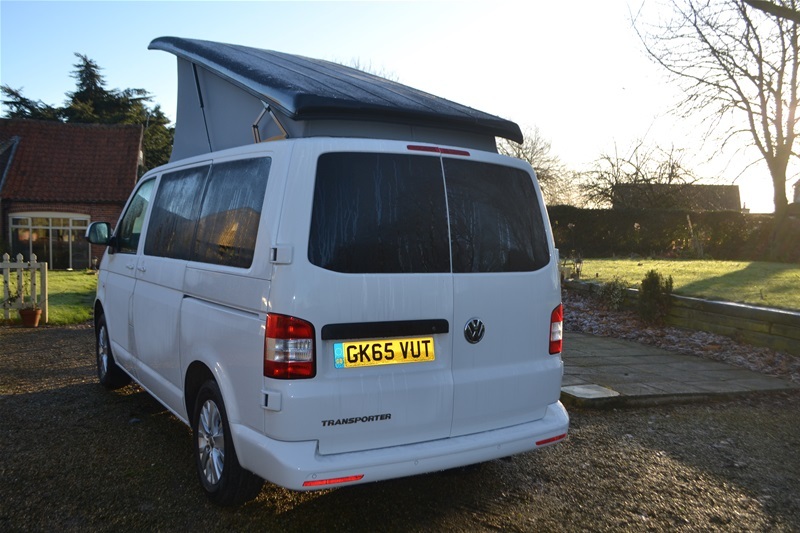 This top specification LWB campervan has just come in and it's got the lot. LWB, 140bhp engine linked to a 6 speed gear box, cruise control, parking sensors, air conditioning, Webasto diesel heating, 20" black Audi alloy wheels, black side bars, wind deflectors, black Fiamma wind out awning. 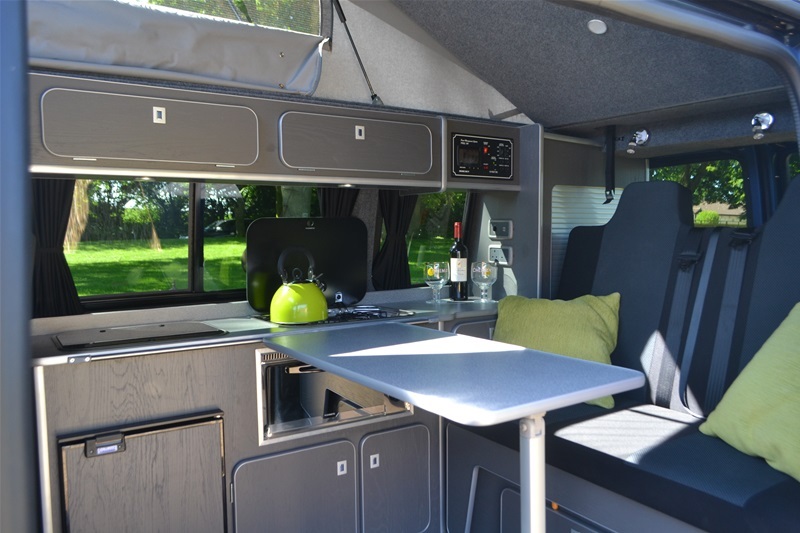 The interior grey Beach Hut furniture more than compliments the exterior of this camper. 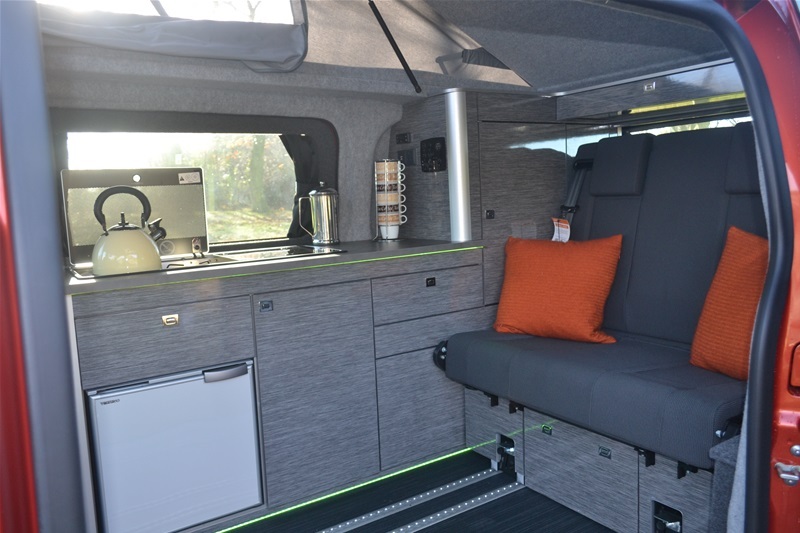 The conversion includes ample storage, elevating roof with bed on gas struts, hob, sink, grill, fridge, full electric hook up facility, 110 amp leisure battery, double swivelling passenger seat giving 5 belted seats in all, porta potti storage, certificated bed with built in head restraints, 12 volt LED lights plus auto entry/exit lights, on board water tank. 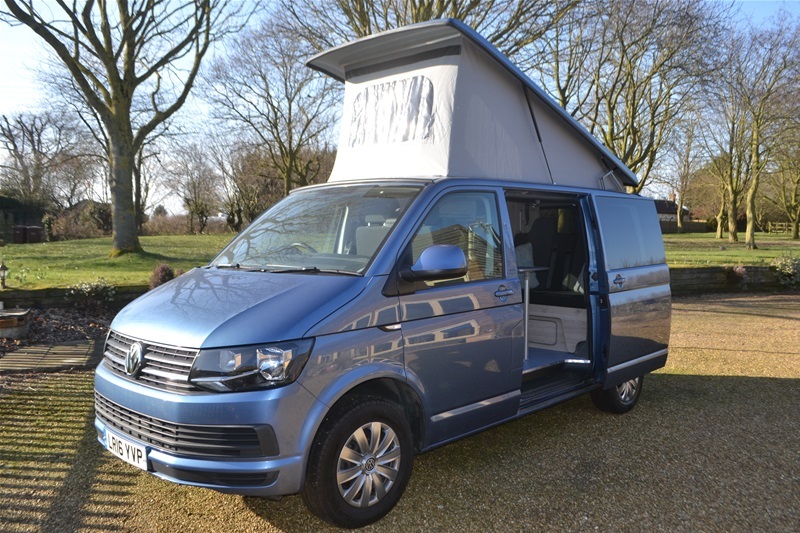 So, if you are a VW enthusiast and you are looking for a camper that is great to drive think 140bhp plus 6 speed gearbox that is great for camping. 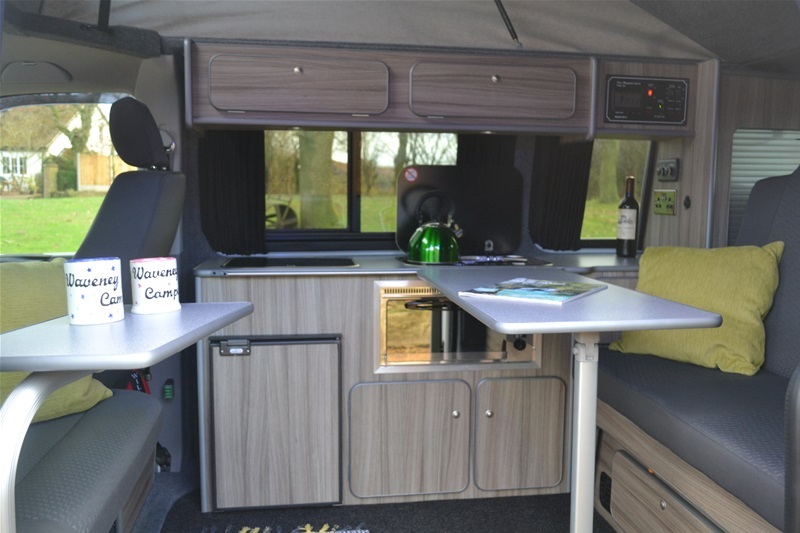 Think LWB with loads space that you can use all year round. Think Webasto diesel heater. 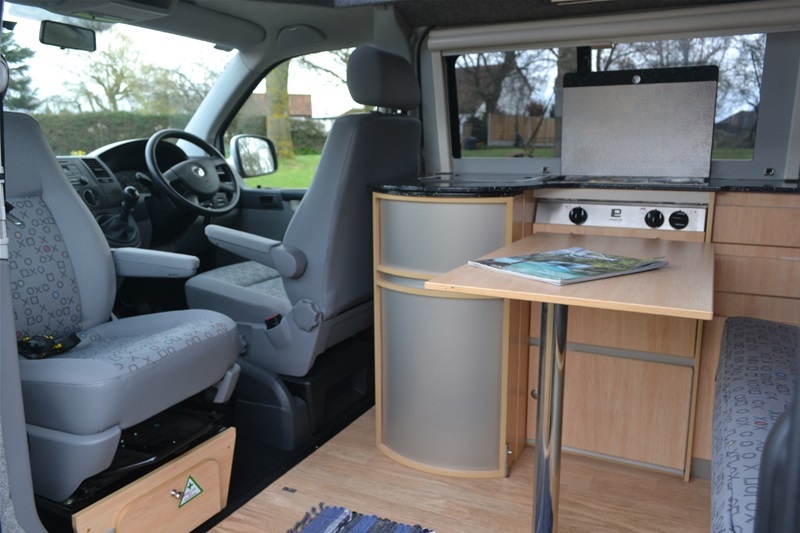 If you want to drive a VW camper that has the look then come and have a look at this one. You definitely won't be disappointed. A rare find indeed. 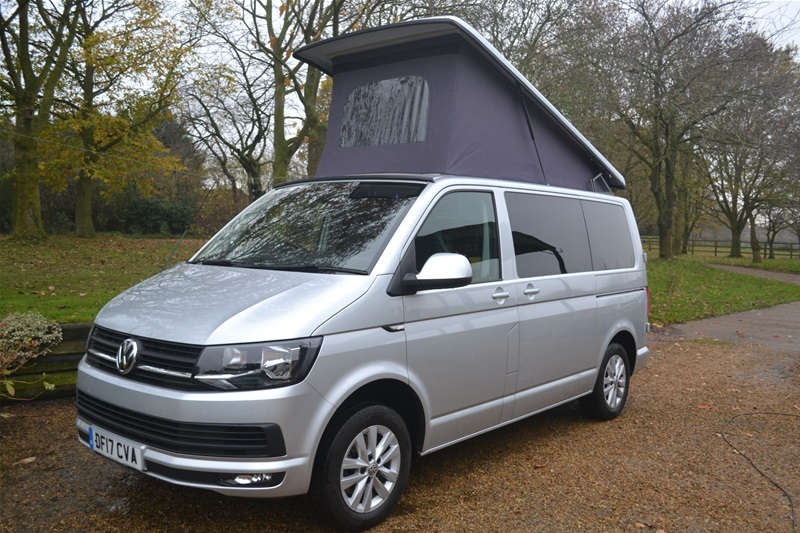 A T6 Trendline in our favourite colour metallic gunmetal grey. 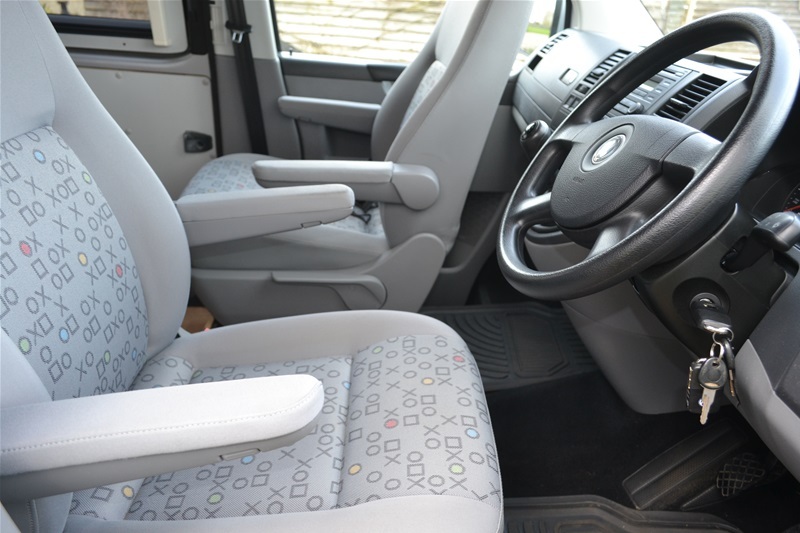 Latest Euro6 engine, air con, cruise control, parking sensors, captains seat and covered just 15,ooo miles. 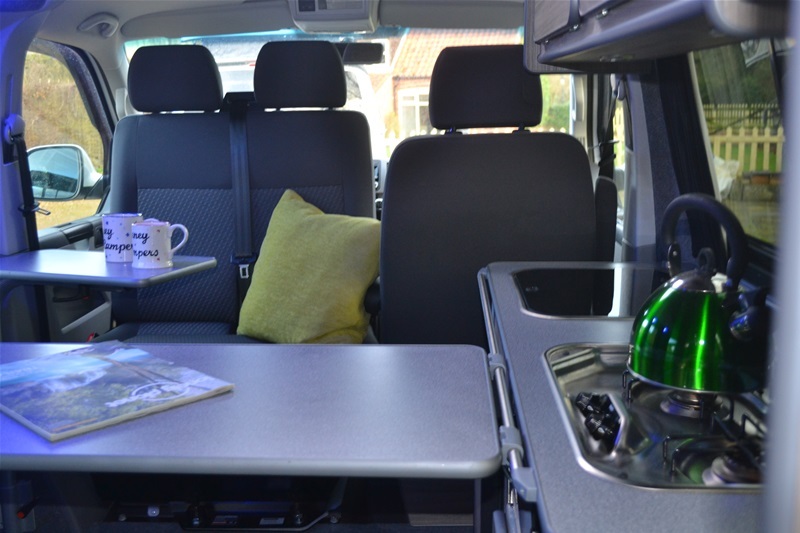 That is the exact specification we like for a campervan. 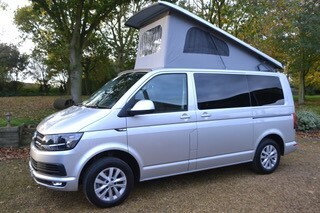 The conversion includes more than ample storage, elevating roof with bed on gas struts complete with panoramic tent, hob, sink, fridge, full electric hook up facility 110 amp leisure battery, double swivelling passenger seat giving 5 belted seats in all, certificated bed, 12 volt soft touch lights. 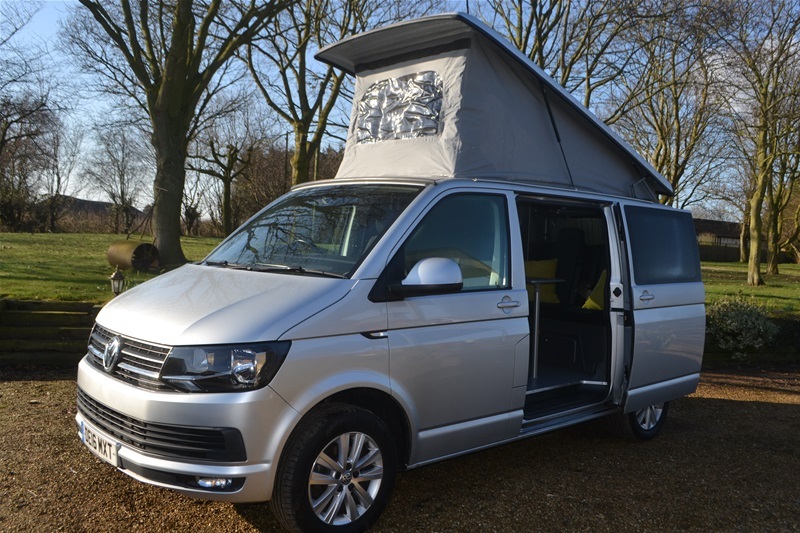 102 bhp with a super smooth Euro6 engine gives great fuel economy so a great driving experience and a super looking camper van. Ready to go camping now. 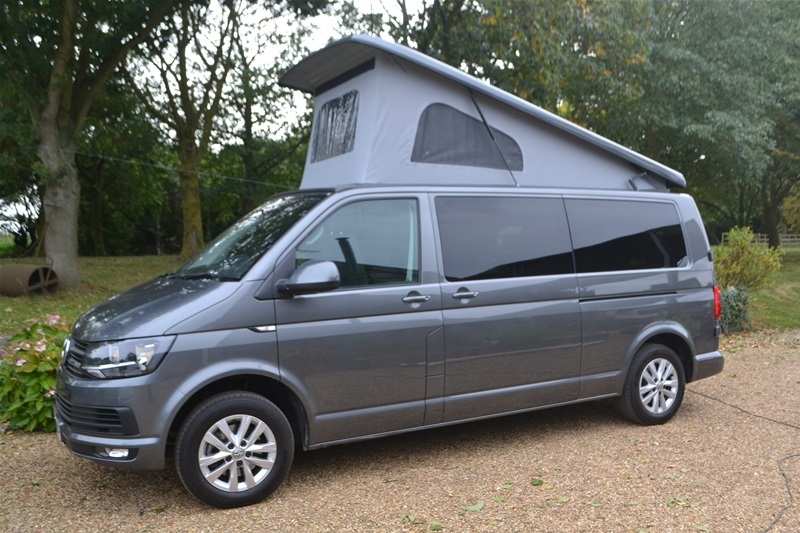 We bought three of these superb silver T6 Hi lines at the same time. This is the last one to be converted and as with the other two it looks fabulous. 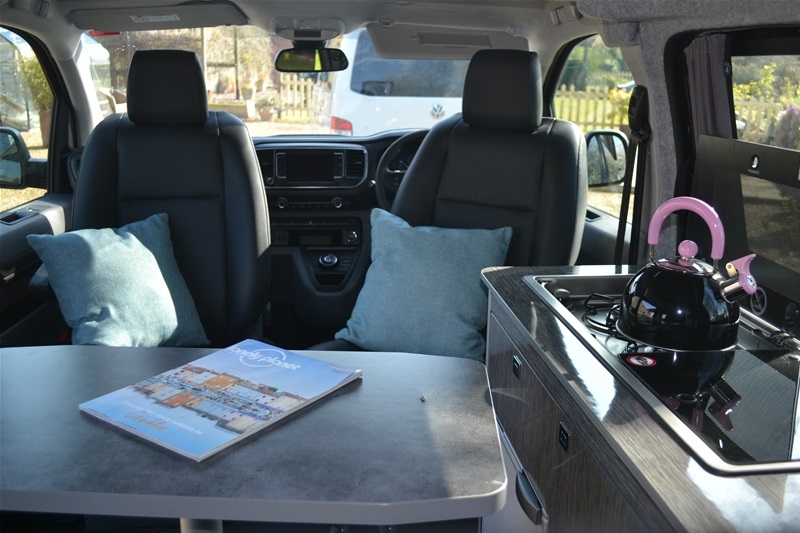 The Hi line spec comes with all the extras that you would want on a camper including cruise control, parking sensors, captains seat, aircon and this particular van has the addition of a factory fitted sat nav. The conversion includes more than ample storage, elevating roof with bed on gas struts, hob, sink, grill, fridge, full electric hook up facility, 110 amp leisure batttery, double swivelling passenger seat giving 5 belted seats in all, porta potti storage, certificated bed with built in head restraints, 12 volt LED lights plus auto entry/exit lights, 60 litre on board water tank. 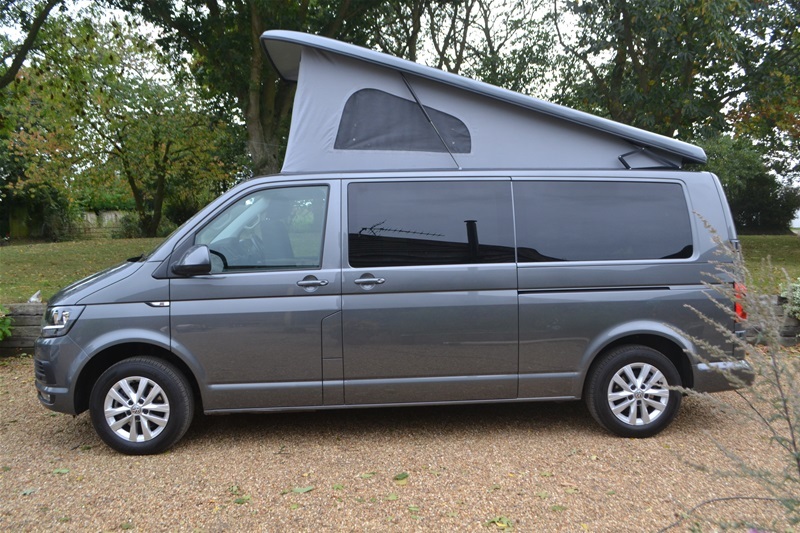 So, a superb low mileage T6 with a full camper conversion powered by the latest Euro 6 low emission 102bhp engine. Ready to go now. Sold with the balance of the manufacturers warranty and 12 months habitation warranty. Just occasionally we get something that comes in as part exchange that is that little bit extra special and this is one of those campervans. 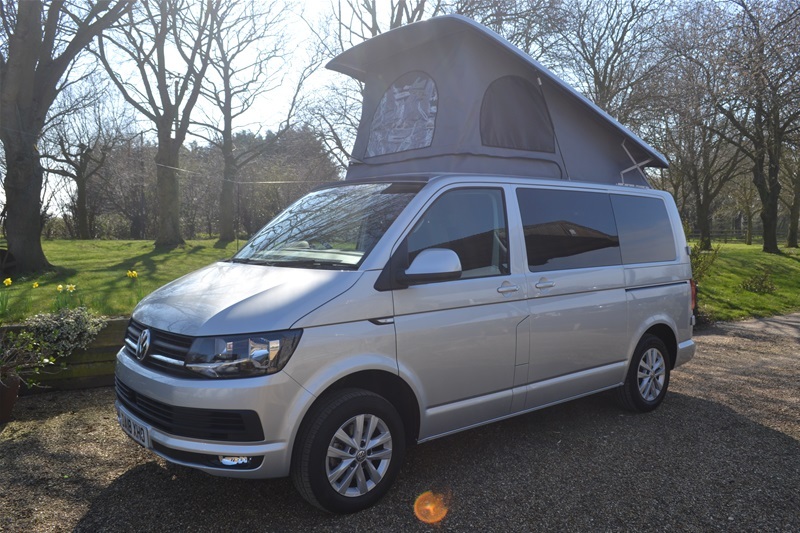 Finding vans in the mid £20,000 price bracket is our biggest problem and yet the majority of people when asked are looking to spend somewhere between £20 - 25,000. Here we have a top specification VW that has been incredibly well cared for and had money spent on it by a real VW enthusiast. 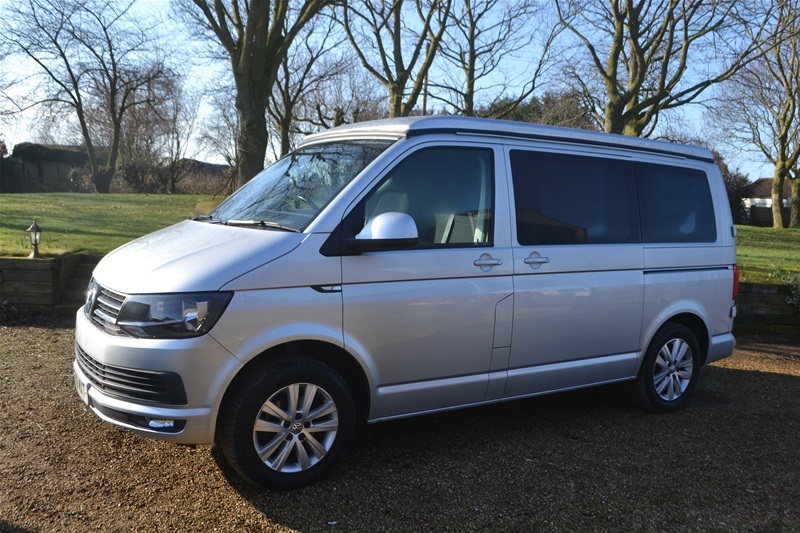 On the face of it we have a fairly standard VW Transporter but it has the all important air conditioning and it has also had it's engine professionally remapped to 140bhp making it a great camper to drive. 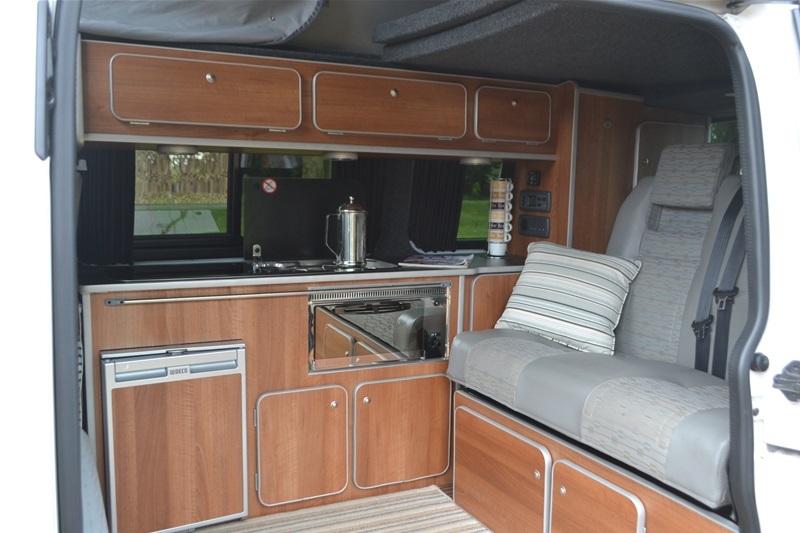 Again, the interior is our standard conversion but so much more has been added i.e Eberspacher diesel heating, extra 240 volt sockets and also a Rib safety bed complete with an invoice for £2670. 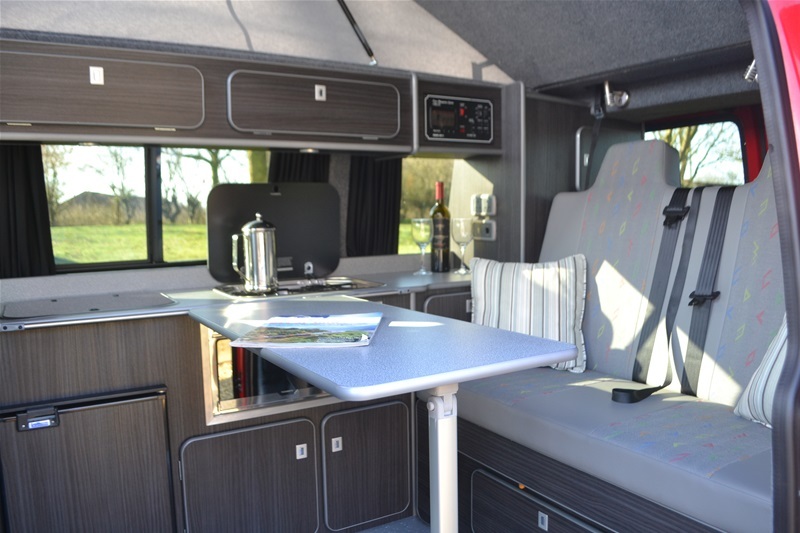 This superb camper also comes complete with everything needed to go camping including silver screens, new driveaway awning, insulated roof cover etc. 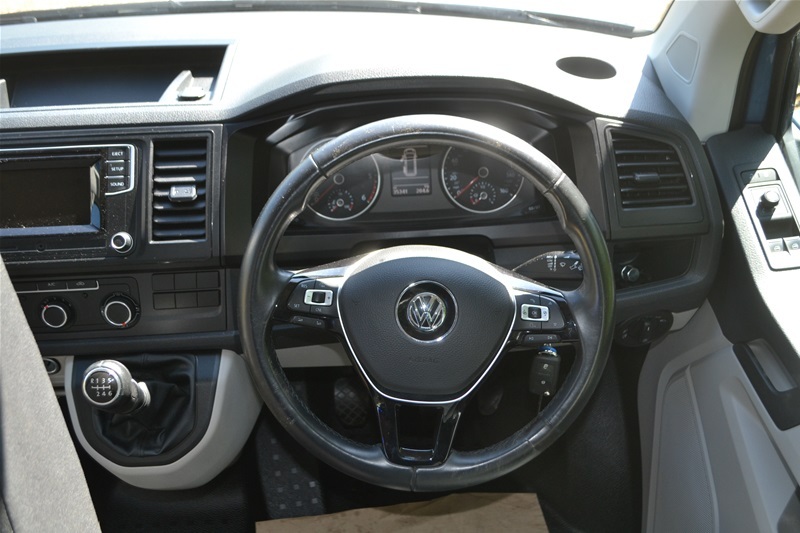 Other finishing touches include rear and front carpeting, new leather steering wheel, LED driving lights, new factory VW alloy wheels, upgraded DAB radio, VW multirail. 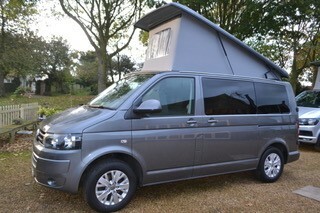 This camper has always been VW serviced, recently done at Robinsons of Norwich with a bill for £750. It has an up to date MOT and the all important cam belt has been changed. All invoices for work that has been done are available. 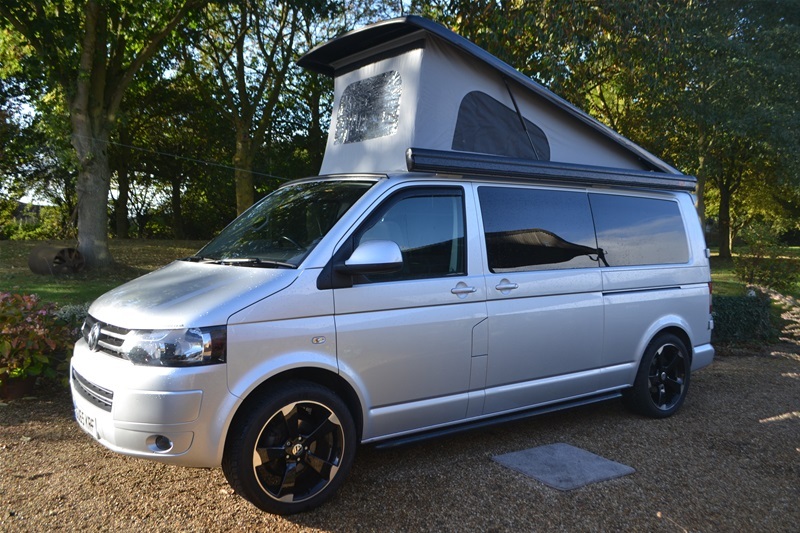 So, if you are looking for a VW camper that drives as good as it looks come and take a look at this one. 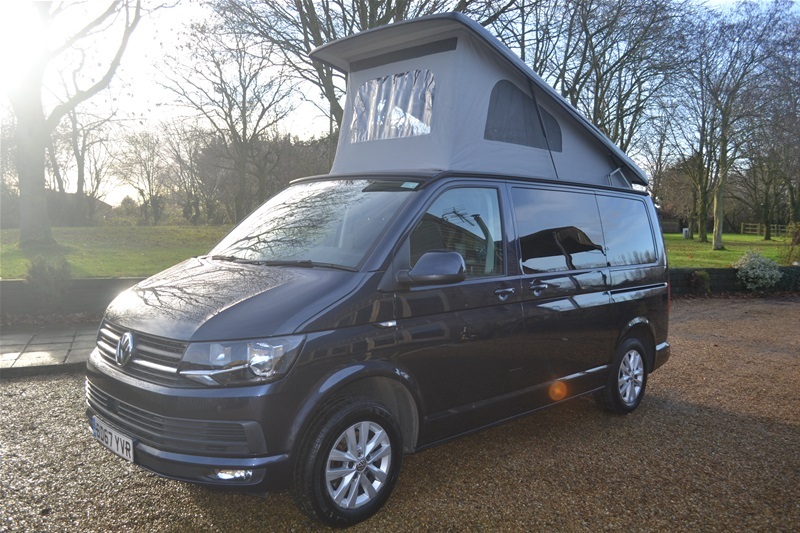 You won't be disappointed and it is ready to go camping now..
We have just sold a black 140bhp camper that had all the extras on it for which we had loads of enquiries. Well here is something similar in white. 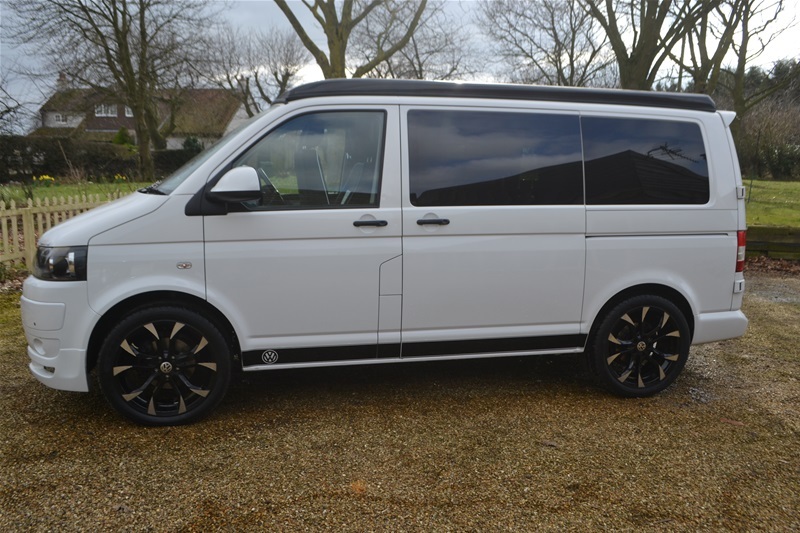 A late 2011 T5 with 140bhp engine linked to a 6 speed gear box (don't be fooled by people who advertise a 140bhp camper that has just had an engine remap. If it hasn't got a 6 speed gear box it is not a genuine 140bhp). 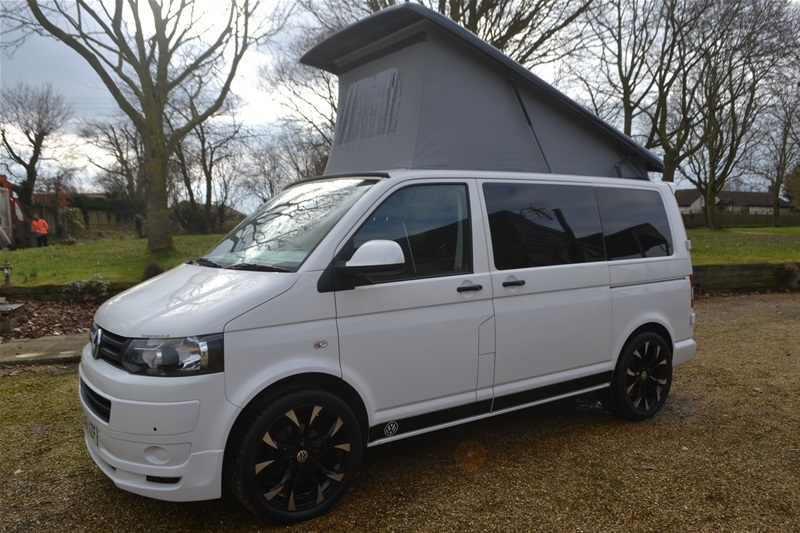 Other extras on this camper include full electric pack, parking sensors front and rear, 20" VW alloy wheels, rear spoiler full body kit, air conditioning, Propex gas heating and detachable tow bar. 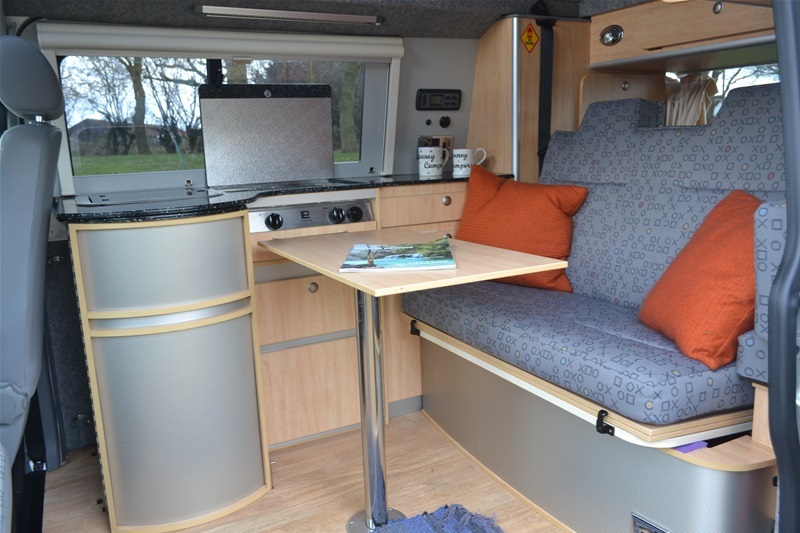 A stunning looking camper and the look inside compliments it beautifully. Upholstery in black and white faux leather and furniture in white Beach Hut with black edging. A great retro look. The conversion includes ample storage, elevating roof with bed on gas struts, hob, sink, grill, fridge, full electric hook up facility, 110 amp leisure battery, double swivelling passenger seat giving 5 belted seats in all, porta potti storage, certificated bed with built in head restraints, 12 volt LED lights plus auto entry/exit lights, on board water tank. A super cool retro VW camper that is certain to turn heads and will not only give a great camping experience but a great driving experience too. Sold with 3 months vehicle warranty and 12 months habitation warranty. 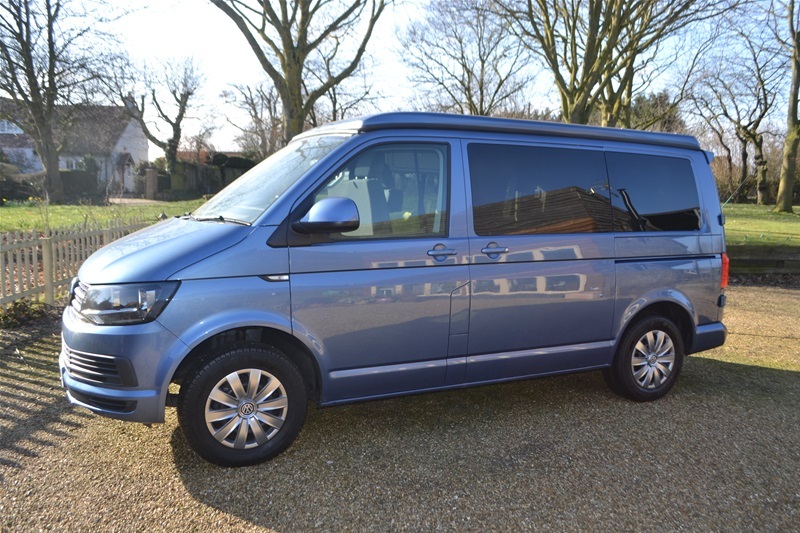 12 month old T6 Hi Line with 150bhp engine, 6 speed gear box, latest Euro 6 engine and in fabulous Acapulco Blue. Ready to go camping now. They don't come any better than this. 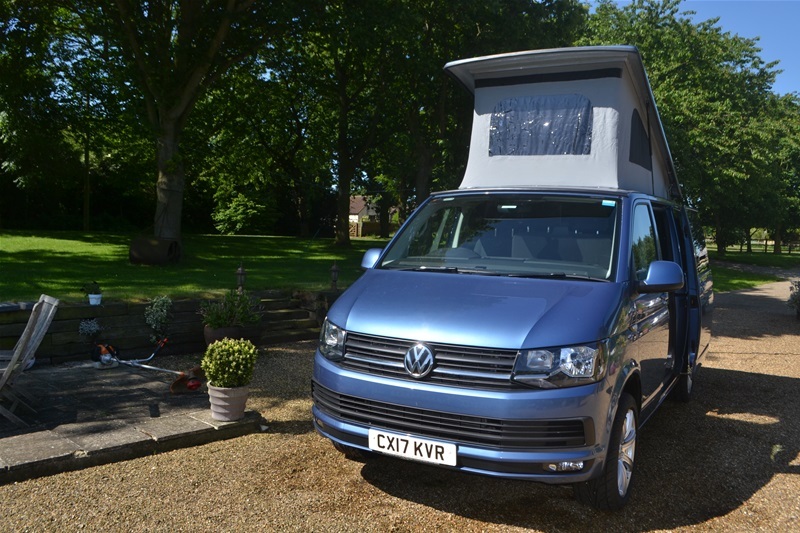 The Hi Line spec, of course, includes all the extras such as air conditioning, cruise control, parking sensors, captains seats etc. etc. 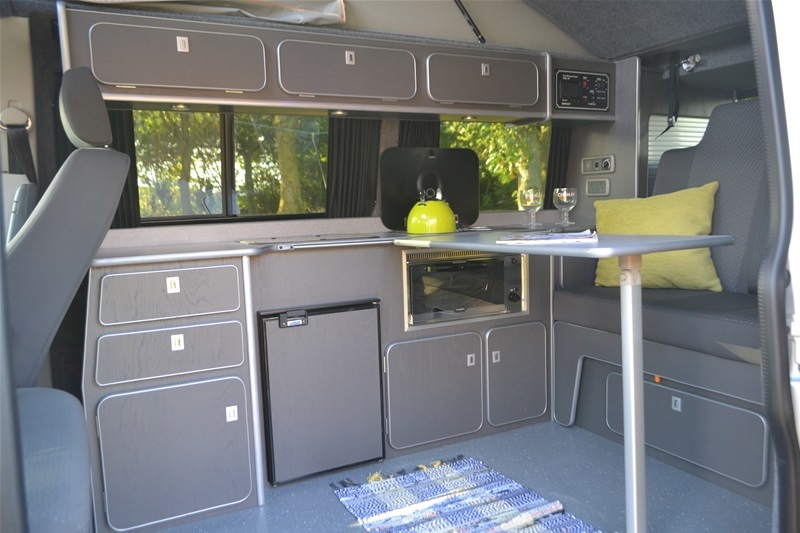 The furniture is in a super graphite grey beach hut with contrasting flooring and work surfaces and includes ample storage, elevating roof with bed on gas struts, gas hob, sink, fridge, full electric hook up facility, 110 amp leisure battery, double swivelling passenger seat giving 5 belted seats in all, porta potti storage, certificated safety bed with built in head restraints, 12 volt LED lights with auto entry/exit lights, on board water tank. 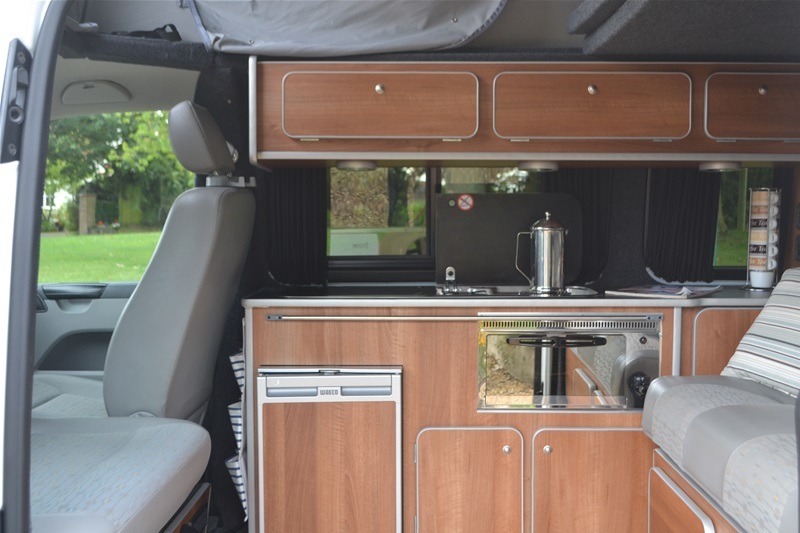 The 150bhp engine linked to a 6 speed gear box is what sets this camper apart from the rest. A fabulous drive and a fabulous looking camper van. Viewing highly recommended. Sold with balance of the manufacturers warranty and 12 months habitation warranty. Just 2 years old and only 13,700 miles covered. 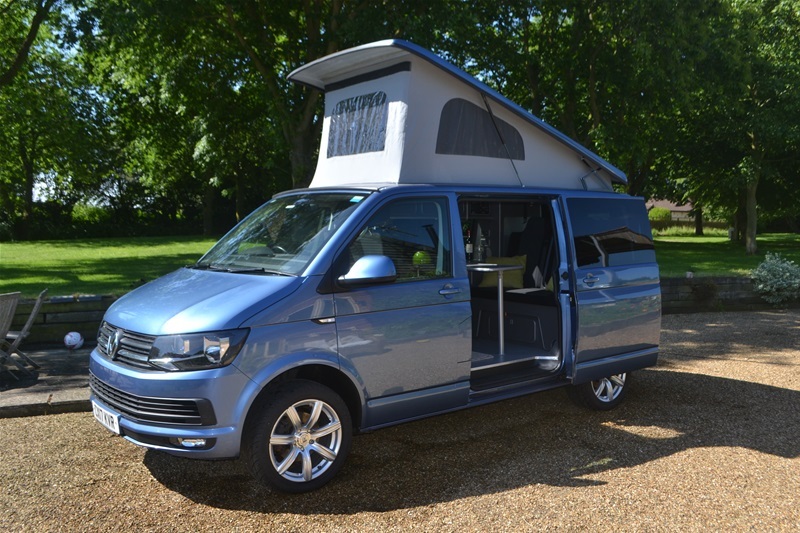 Here is a T6 with a fabulous specification and in lovely Acapulco Blue. A Trendline with aircon, cruise control, reversing sensors, full electric pack, captains seat etc. etc. This camper van is being converted now and will be completed at the end of June. There is still time to choose your own furniture colour, work surfaces, flooring etc. 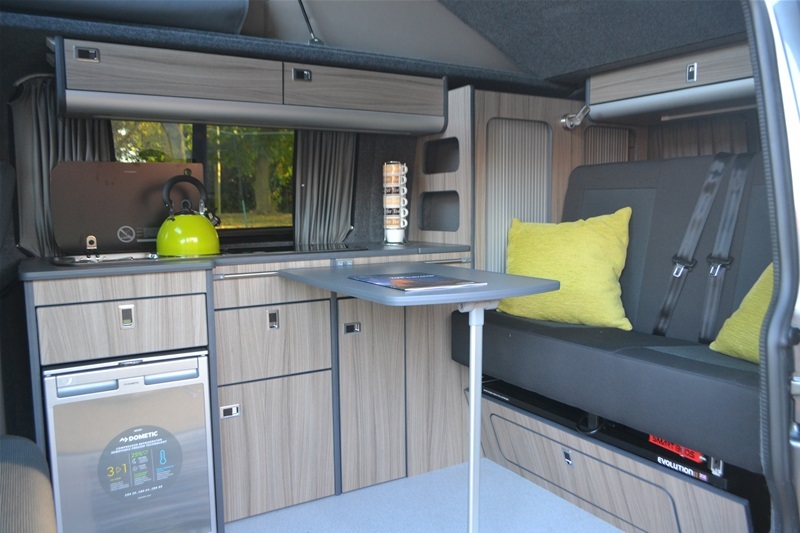 The conversion includes ample storage, elevating roof with bed on gas struts, gas hob, sink, fridge, full electric hook up facility, 110 amp leisure battery, double swivelling passsenger seat giving 5 belted seats in all, porta potti storage, certificated safety bed with built in head restraints, 12 volt LED lights with auto entry/exit lights, on board water tank. 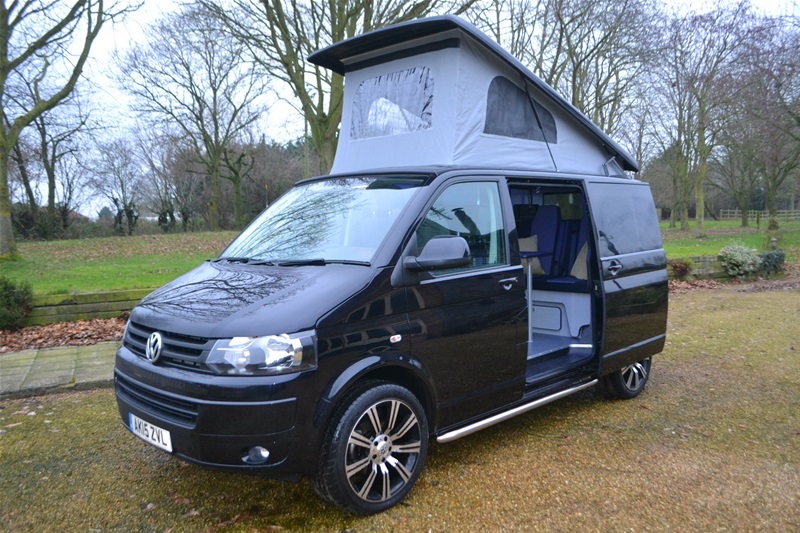 A great camper powered by a powerful 2 litre 102 bhp engine. Book a test drive today. Sold with the balance of the manufacturers warranty and 12 months habitation warranty. 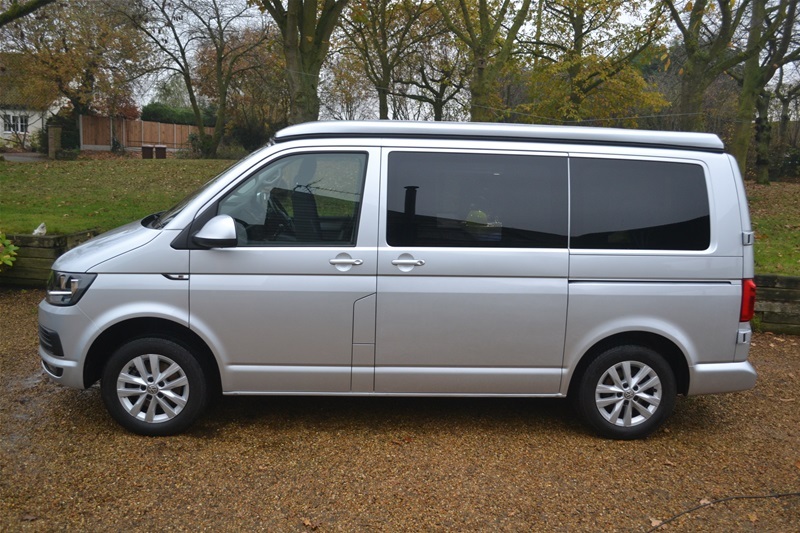 A top of the range high spec VW T6 in ever popular silver. 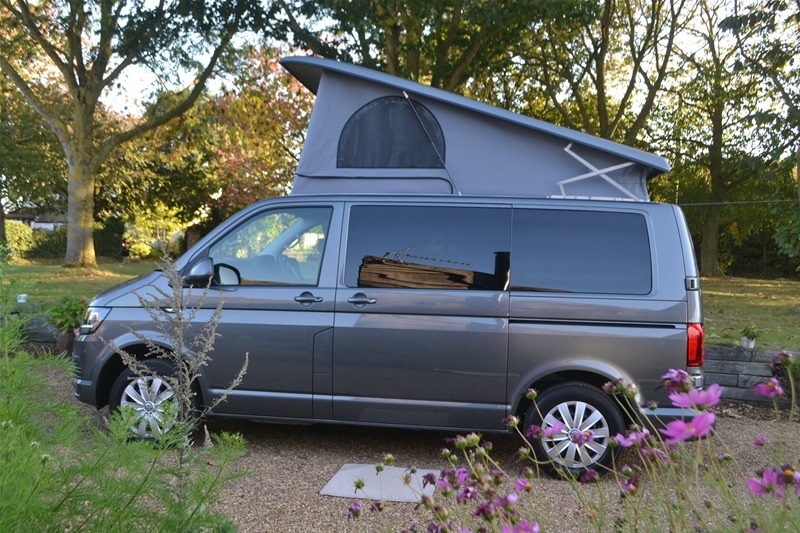 Camper vans just always look good in this understated colour particularly when standing on a set of factory original VW alloy wheels. 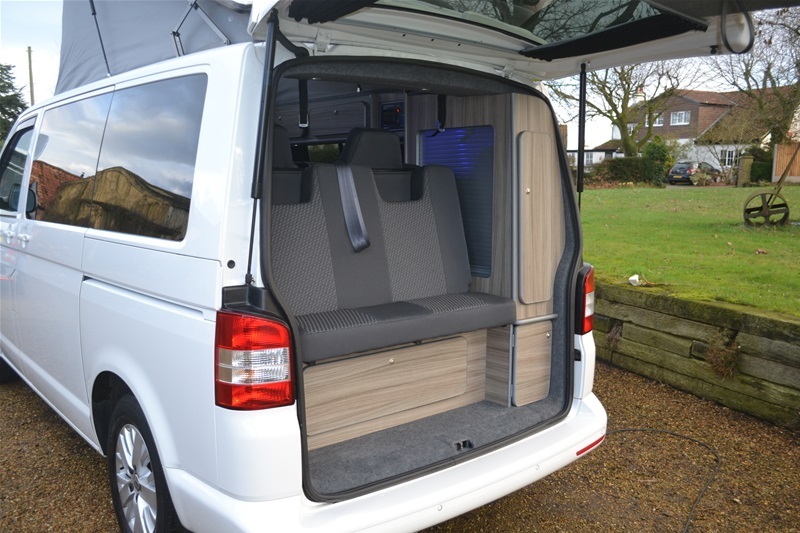 A T6 Hi Line benefits from all the extras i.e. cruise control, captains seat, reversing sensors, extra drivers lights, air conditioning, multi function steering wheel, full electric pack. 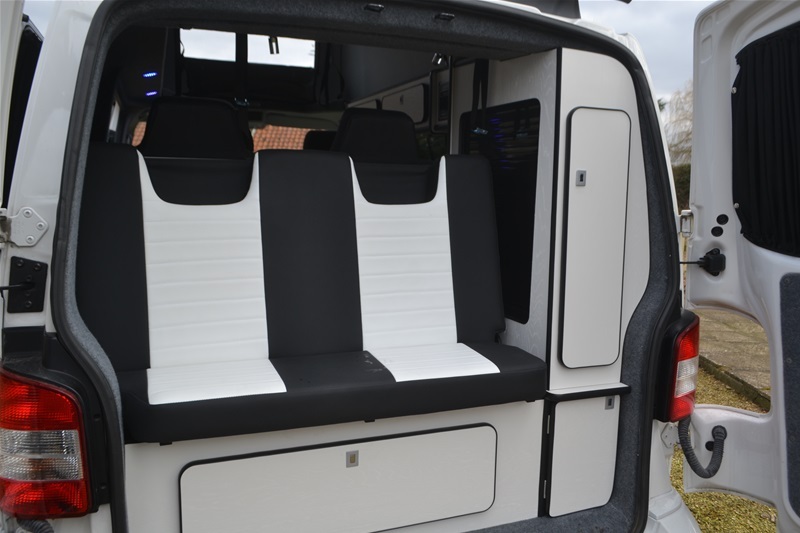 The conversion includes ample storage, elevating roof with bed on gas struts, hob, sink, fridge, grill, full electric hook up facility, 110 amp leisure battery, double swivelling passenger seat giving 5 belted seats in all, porta potti storage, certificated safety bed with built in head restraints, 12 volt LED lights with auto entry/exit lights, on board water tank. 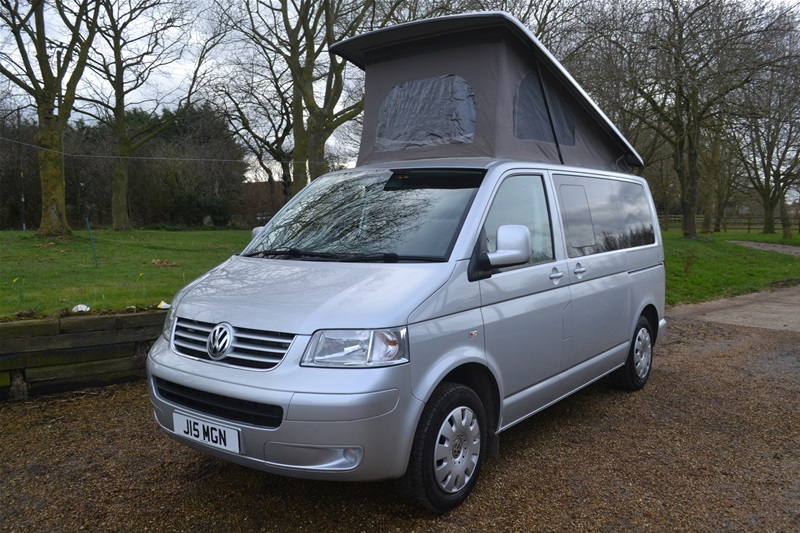 A top specification, low mileage T6 Hi Line which benefits from the addition of a tow bar and awning rail. 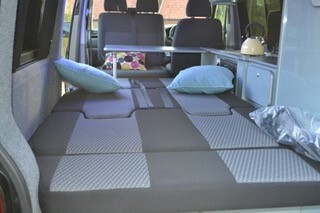 It will be sold complete with a full starter kit so everything is here to start your camper van adventure now. 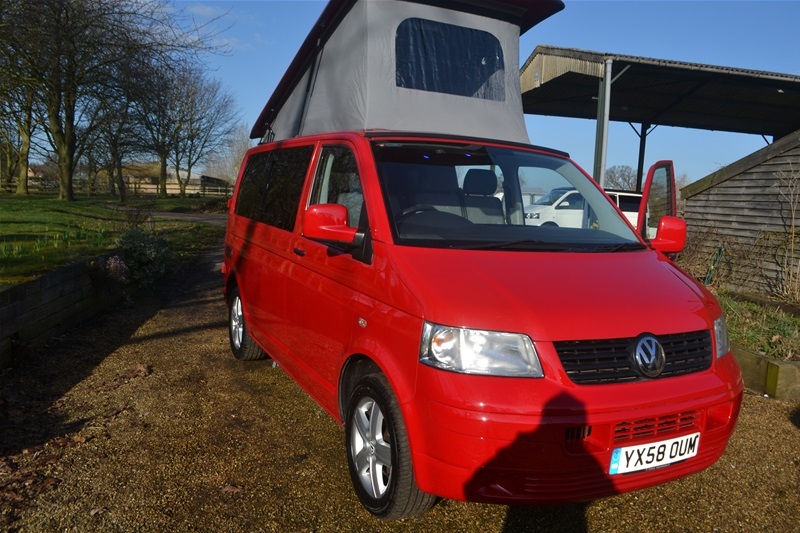 A vibrant, stunning looking T5 camper van in red and at an age and price that we find it difficult to come across. 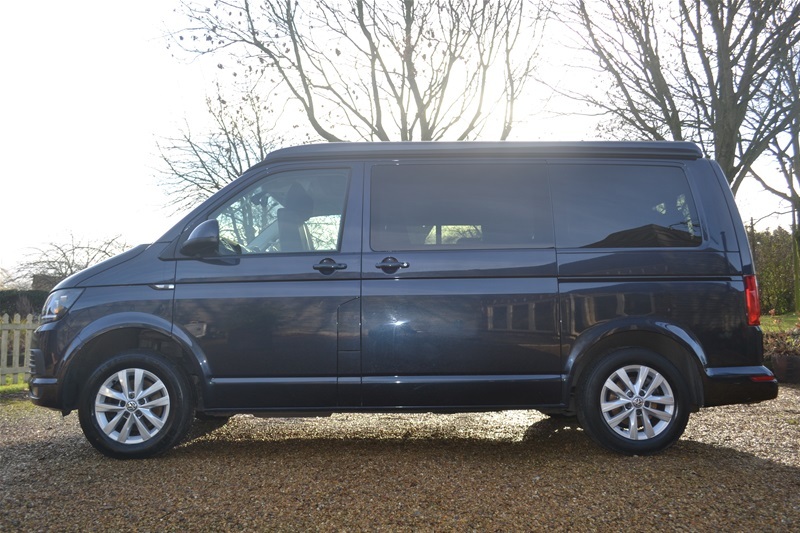 So a 2008 T5 with a brand new conversion in carbon ash with contrasting work surfaces and flooring and with a very respectable 78,000 miles and fully serviced by VW. 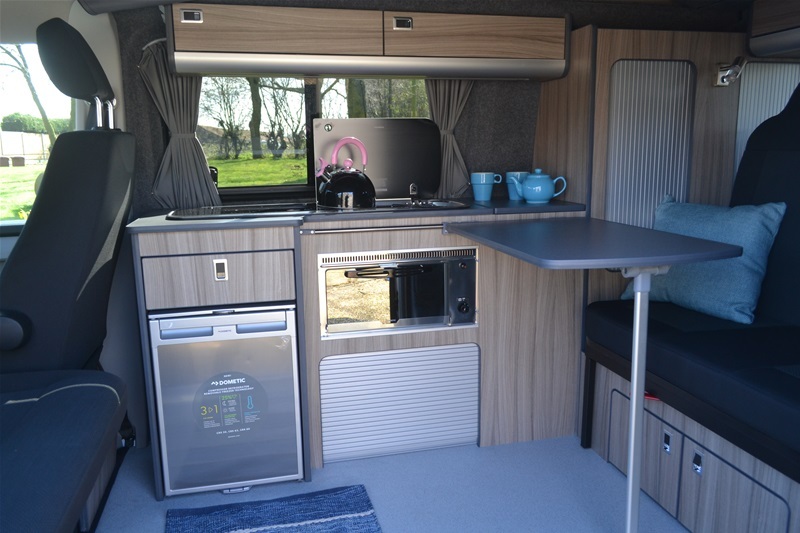 The conversion includes ample storage, elevating roof with bed on gas struts, gas, hob, sink, fridge, full electric hook up facility, 110 amp leisure battery, double swivelling front passenger seat giving 5 belted seats in all, porta potti storage, certificated safety bed with built in head restraints, 12 colt LED lighting with auto entry/exit lights, on board water tank. 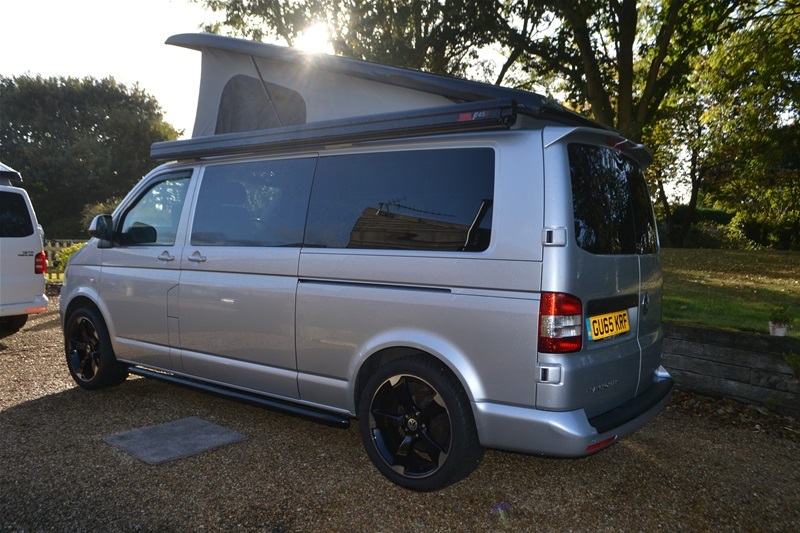 This camper really is in superb condition and with it's 102 bhp engine it drives as well as it looks. It is very hard to find campers of this age in such good condition and ready to go camping now. Sold with 3 months vehicle warranty and 12 months habitation warranty. The conversion includes ample storage, elevating roof with bed on gas struts, hob, sink, grill, fridge, full electric hook up facility, 110 amp leisure battery, double swivelling passenger seat giving 5 belted seats in all, porta potti storage, certificated bed with built in head restraints, 12 volt LED lights plus auto entry/exit lights. 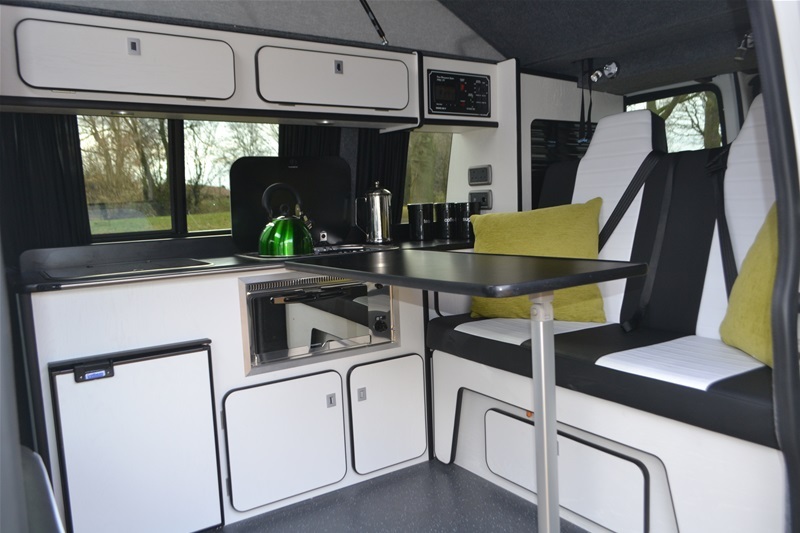 The interior is done in our latest metallic silver finish with black edging and a contrasting black tambour wardrobe door. The effect, as on the outside, is quite stunning. 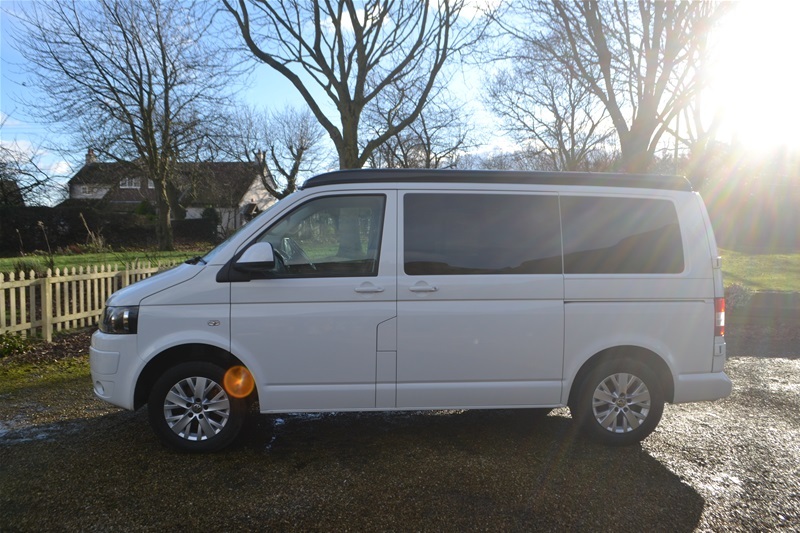 There's just something about the clean lines of a white VW T5 with a contrasting black roof that looks so right for a campervan. 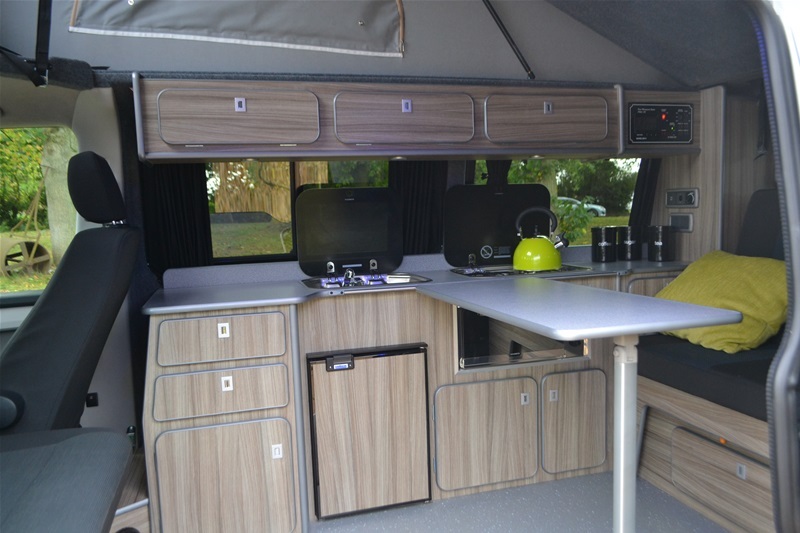 Here we have a top of the range Hi line model with all the extras i.e. 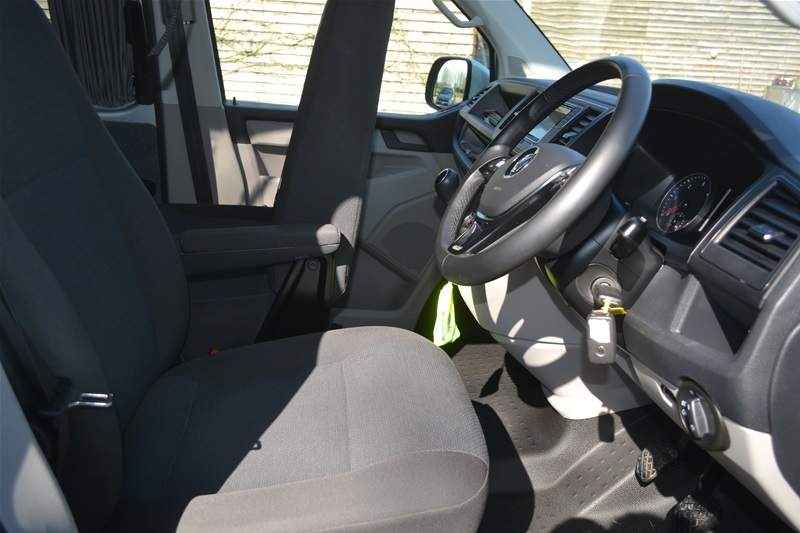 air conditioning, cruise control, reversing sensors, alloy wheels, captains drivers seat. 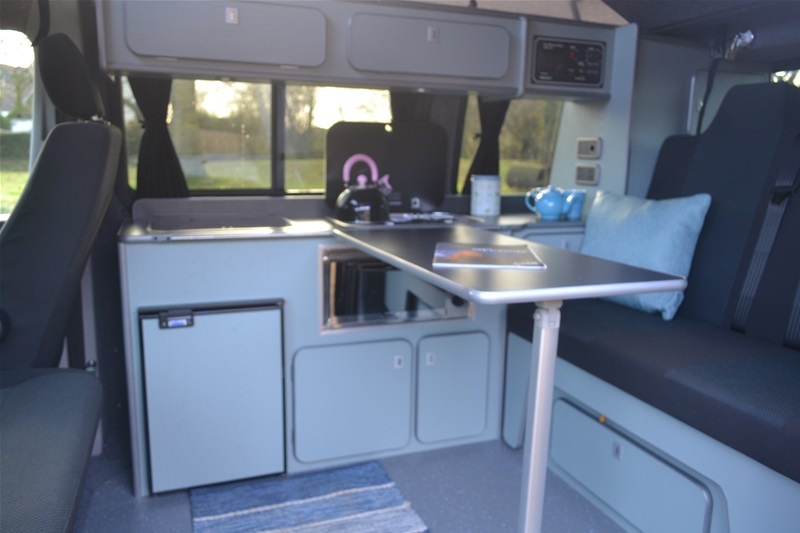 To give this campervan a retro, modern, cool finish inside we have added a high gloss seaside blue furniture with contrasting work surfaces and flooring. The effect is just stunning. The conversion includes ample storage, elevating roof with bed on gas struts, hob, sink, grill, fridge, full electric hook up facility, 110 amp leisure battery, double swivelling passenger seat giving 5 belted seats in all, porta potti storage, certificated bed with built in head restraints, 12 volt lights plus auto entry/exit lights. 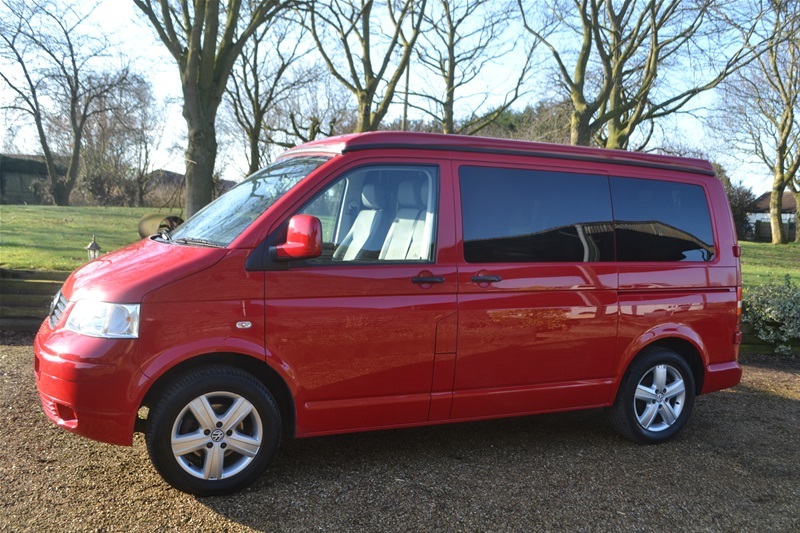 A low mileage T5 that looks like new and with all the extras needed for a great driving and camping experience. Book a test drive today. Sold with the balance of the manufacturers warranty and 12 months habitation warranty. 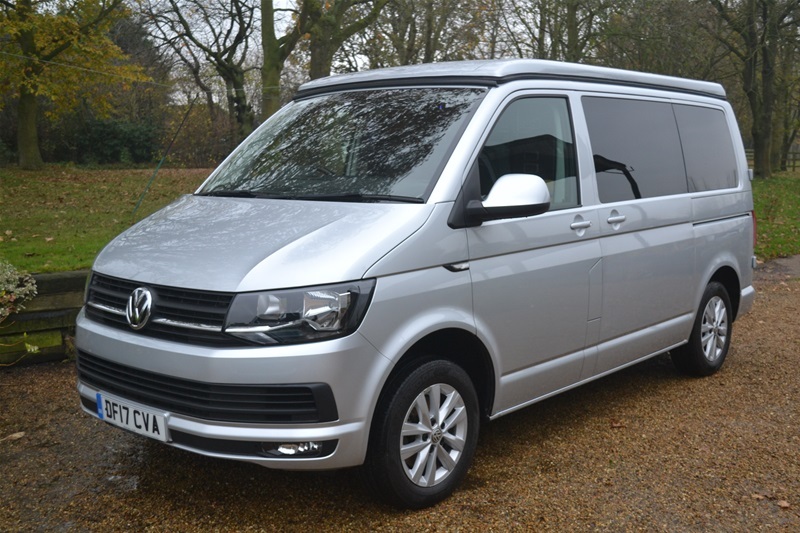 Just 9 months old, the latest T6 Hi Line with Euro 6 engine. 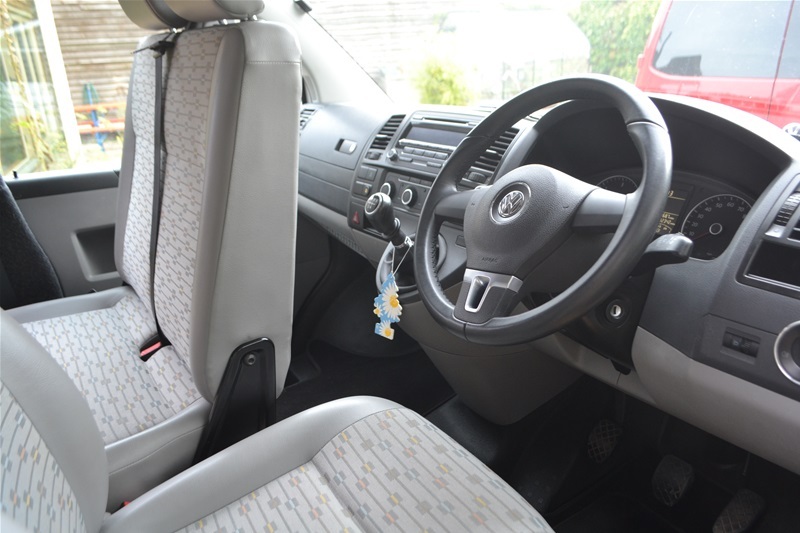 Superb driving experience with a fabulous interior. Just the best of the best. In silver, a top spec Hi line with less than 10,000 miles on the clock. What more could you want. Ready to go camping now. Sold with the balance of the manufacturers warranty and 12 months habitation warranty. 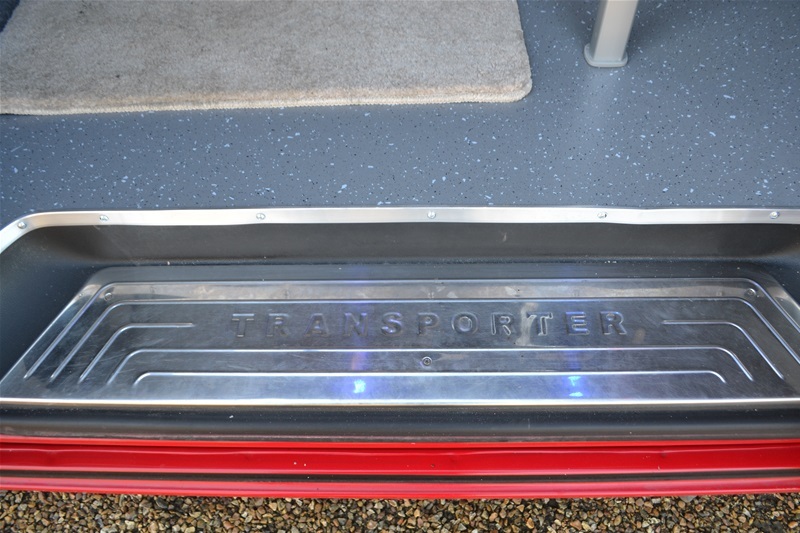 Very, very rare in the campervan world. 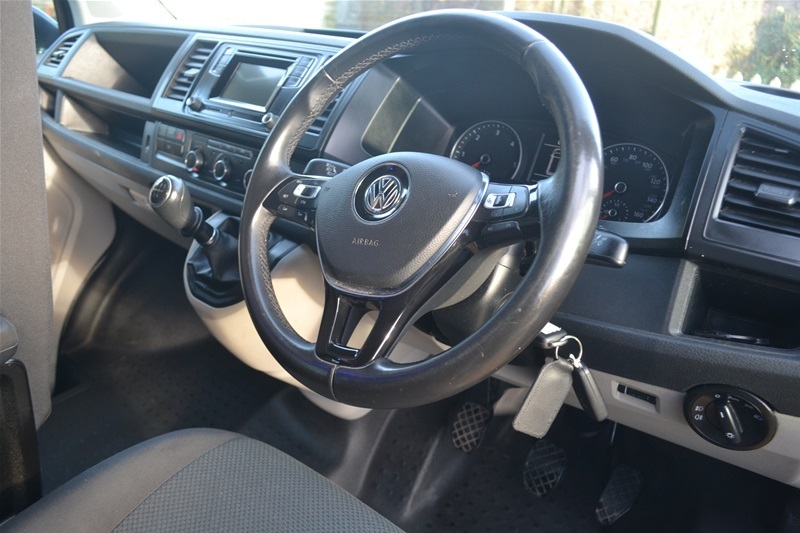 A low mileage VW Hi Line with the superb 7 speed automatic gearbox linked to a powerful 140 bhp engine. Just fabulous to drive. 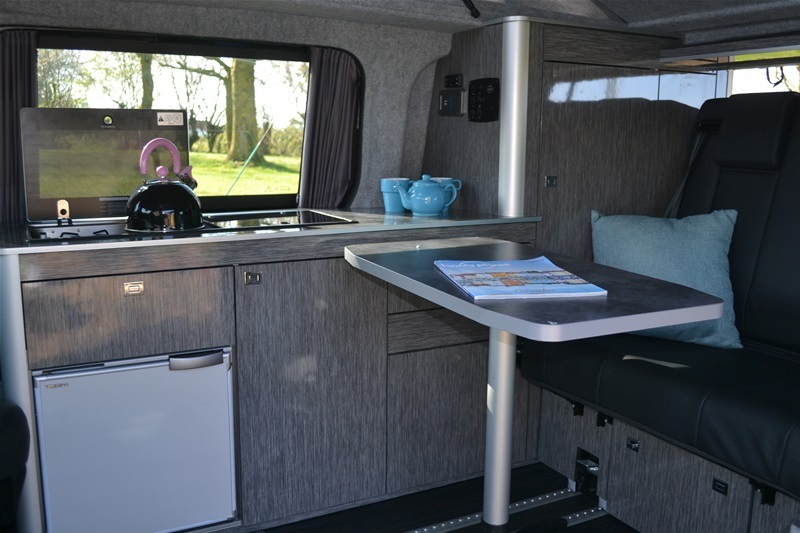 The interior conversion is in a very cool high gloss pale blue with contrasting work surfaces and flooring. 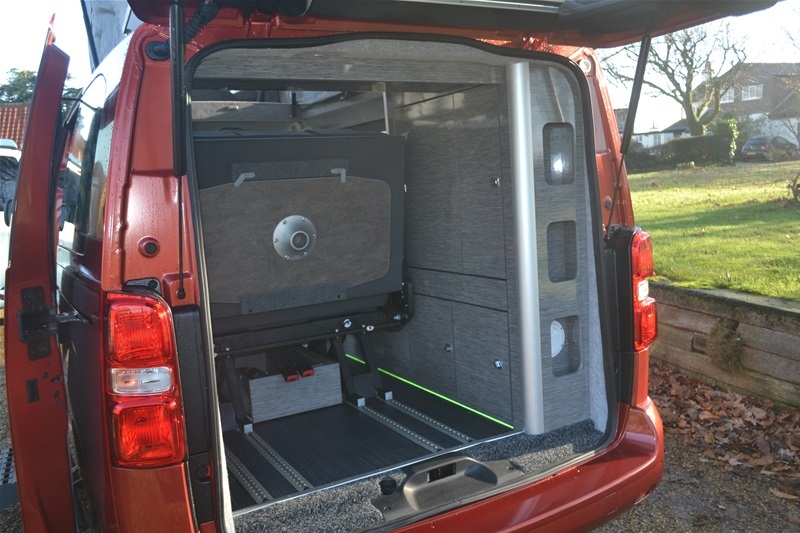 Othe extras include a tow bar, matching Thule back box for those longer adventures andalso the latest Outwell Moveairlite self inflating driveaway awning. 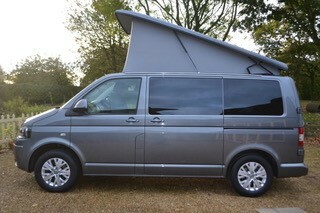 Hard to find and expensive but what a campervan and something that will be sought after for years to come. The Alphard with stylish aerodynamics and a totallyluxurious and airy interior is the best selling MPV in Japan. It is powered by the reliable and economical 2.4 litre petrol engine which achieves in excess of 30mpg. The emissions meet all UK and EU inner city criteria. 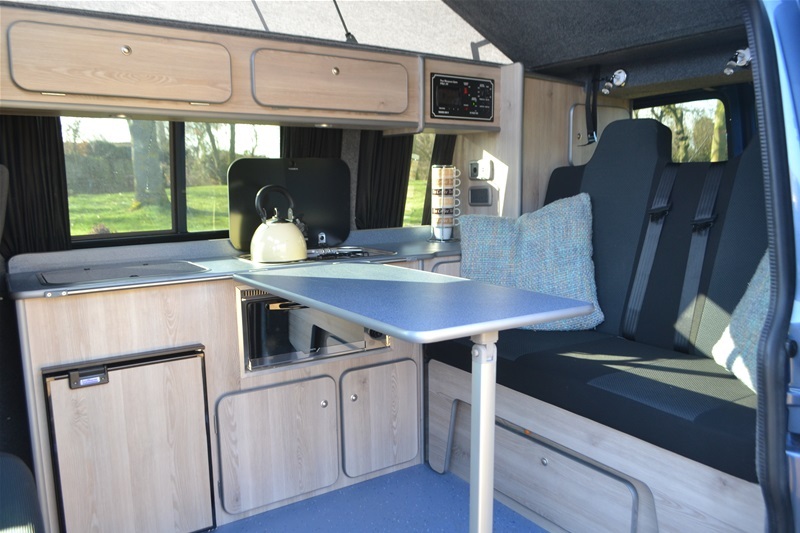 This superb new conversion includes ample storage, elevating roof bed, hob, sink, table, on board water tank, full electric electric hook up facility, swivelling front seat, crash tested bed with head restraints, 12 volt LED heating. 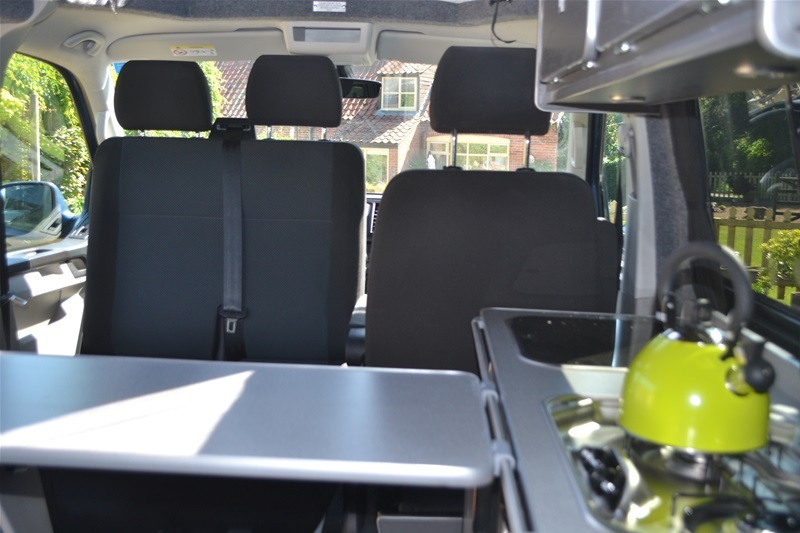 These vehicles offer the highest driving luxury you can get in a caamper van with aircon, tiptronic automatic gearbox, auto lights and parking sensors as standard. They are also a great drive - very smooth and very quiet just as you would expect from a luxury vehicle. Sold with 3 months national warranty and 12 months habitation warranty.